The dust of broken glass ground underfoot, and the smoke of a million corpse-fires fouled the air. 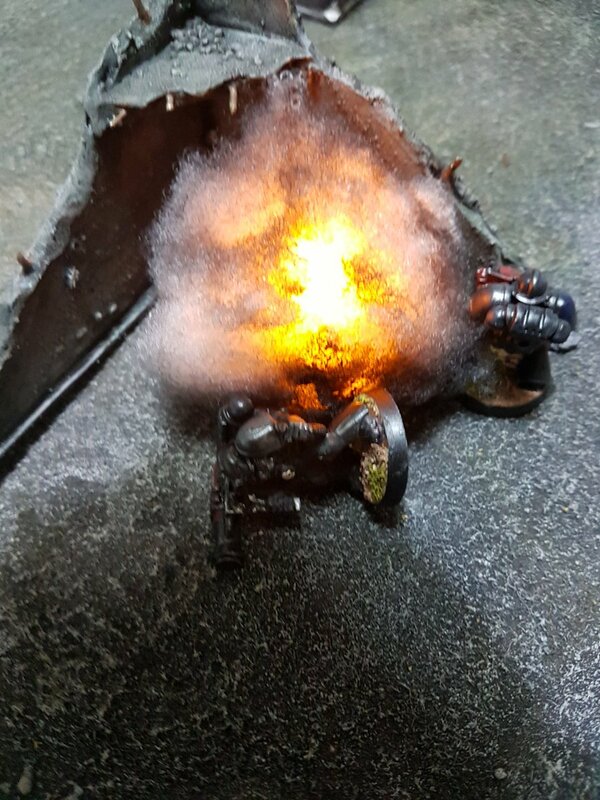 Boss Bludguzzla WarBastard IV took to his feet and breathed deeply of the Armageddon stench. Beautiful. He belched, cocked a leg and let go an insouciant, musical fart. “I luvz da smell of roastin’ humiez in da morning”. 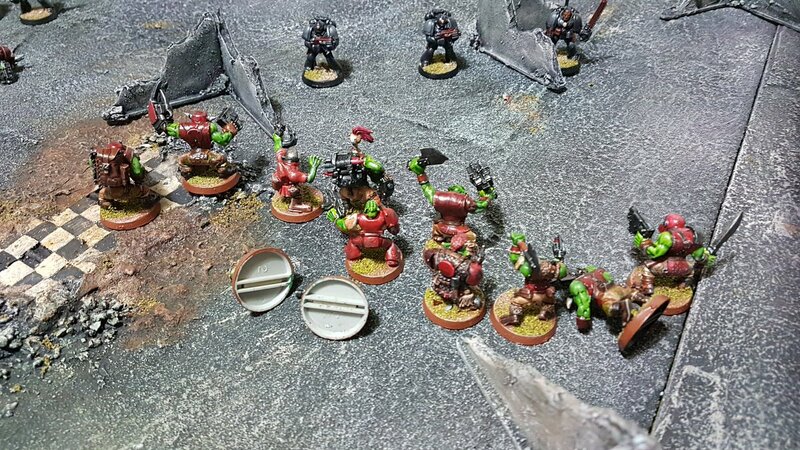 Turning to the motley assortment of Orks gathered in the shell crater before him, he waved a hand toward the biggest ruin on the horizon. 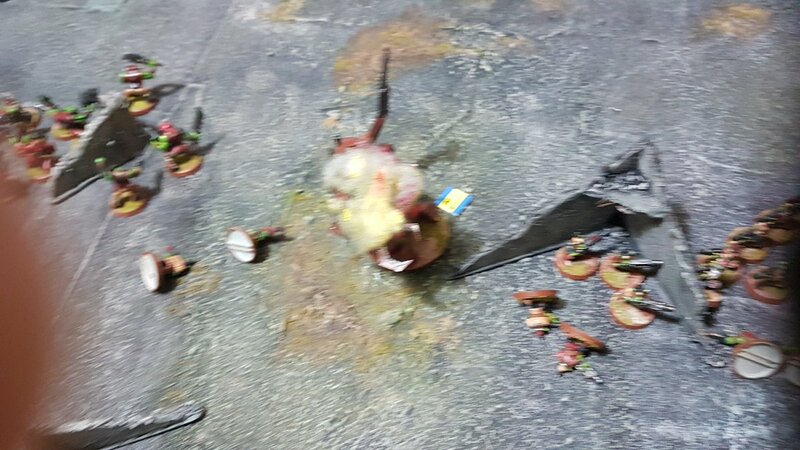 One of the larger Orks cocked an ear. 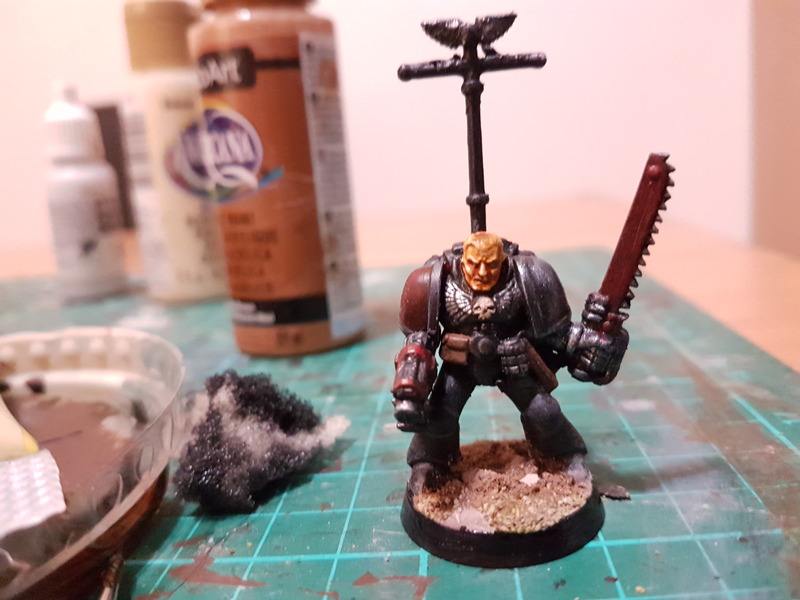 WarBastard jammed a magazine into his bolt pistol. Welcome to Mission 2 from the 2nd Edition Scenario Booklet – High Ground! 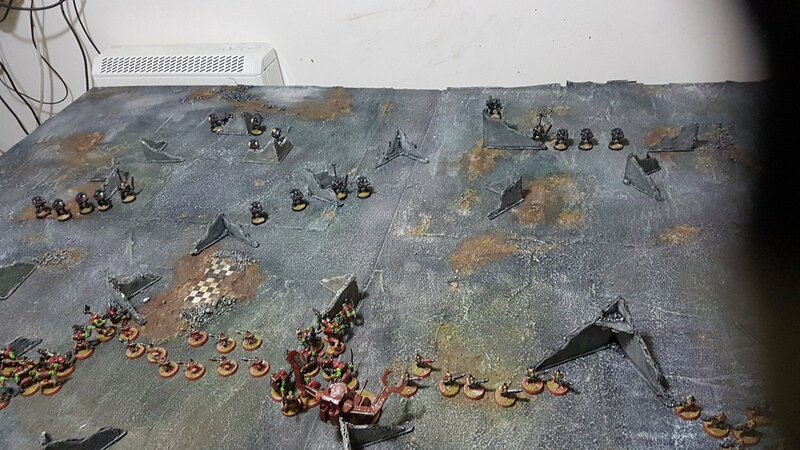 After a close fought first round (no spoilers here), and some frenzied painting on my part after a a couple of lucky eBay wins fleshed out my Ork forces to full strength, Dan and I warmed up the shed and got busy deploying Ork and Marine alike for the next round. 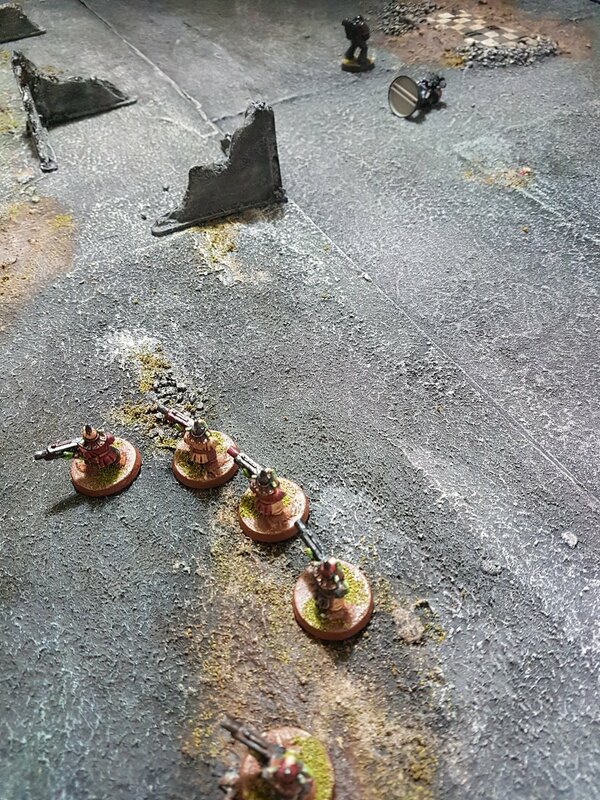 View from the Marine position in the ruined Shrine Of The Emperor Triumphant – frag missiles at the ready, it’s a target rich environment! 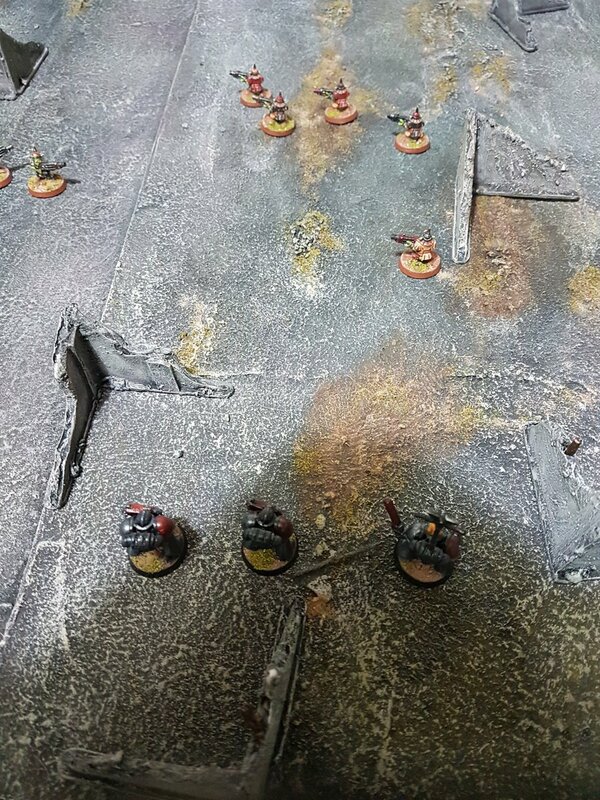 Turn 1 kicked off with the Marines gaining the initiative – no point in breaking cover yet, and no one in range, so they elected to hunker down and blast a frag missile into the densely packed boyz mobs facing them.. 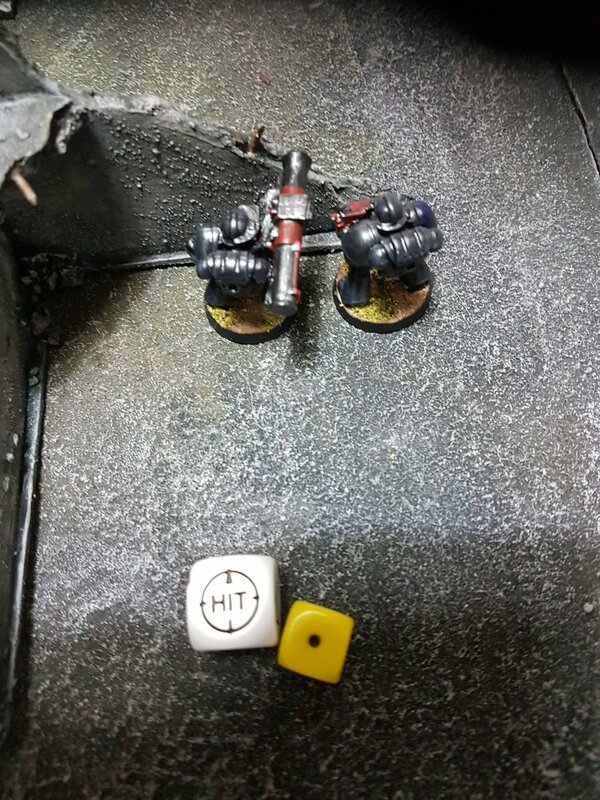 Lacking the artillery dice from the early 90s, we agreed that “1” would equal a misfire, so…..
……yeah. 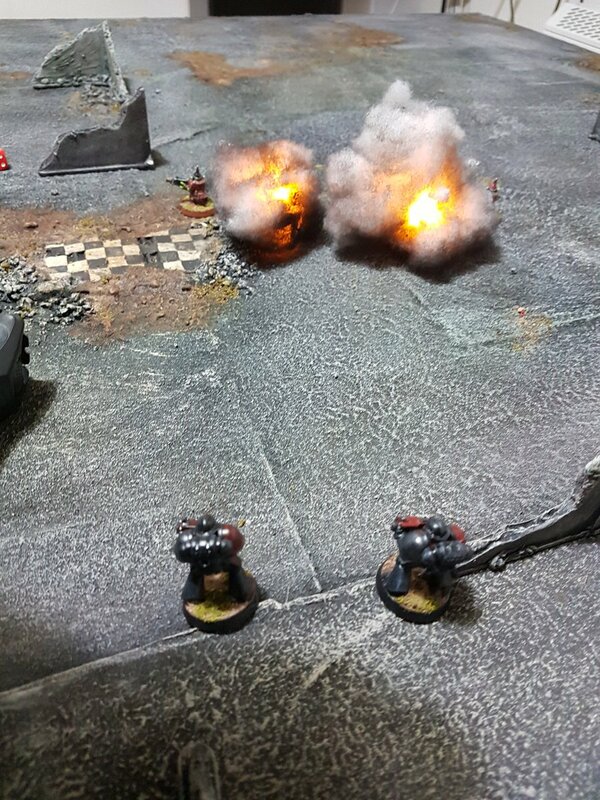 Misfire, exploding both launcher and Marine. Cue some innovative swearing from Dan. 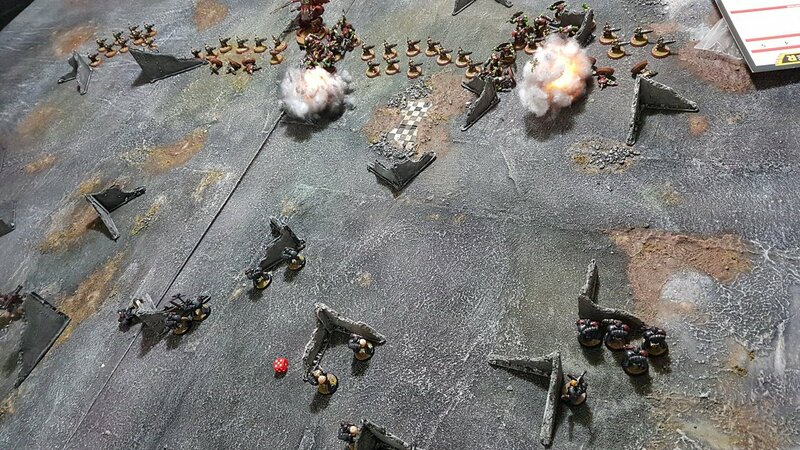 Orks charge toward Marine lines – a few fall, but will it be enough? 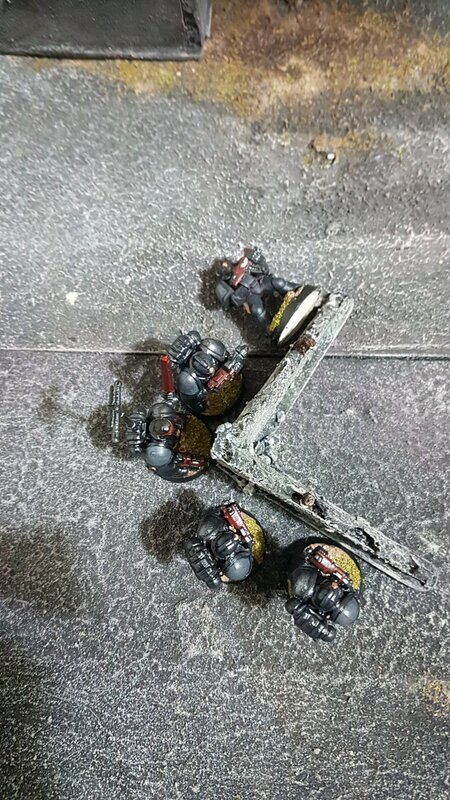 “Squad Broken” – 25% losses in one turn, the Marines fail their morale check! 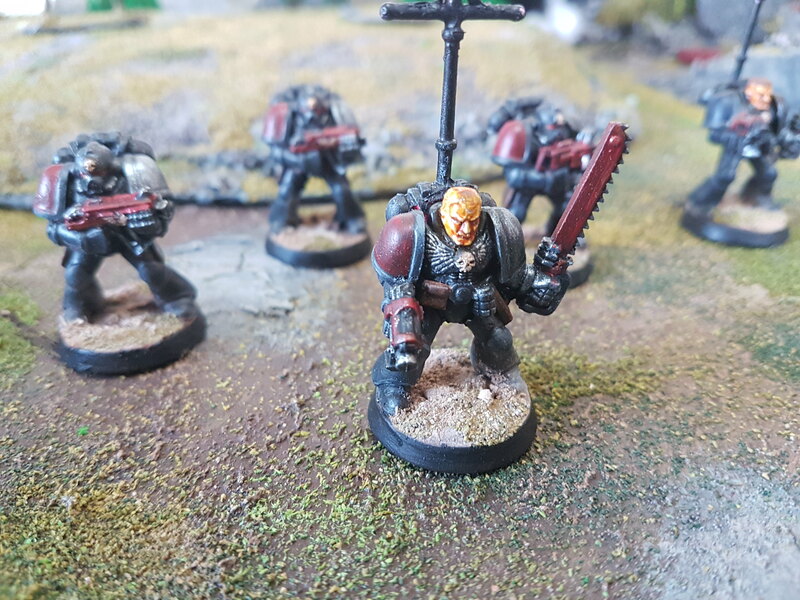 Sergeant Taddeus leads his remaining Marine out to counterattack the Ork assault with bolter and chainsword! Bellowing his war cry, Sgt. 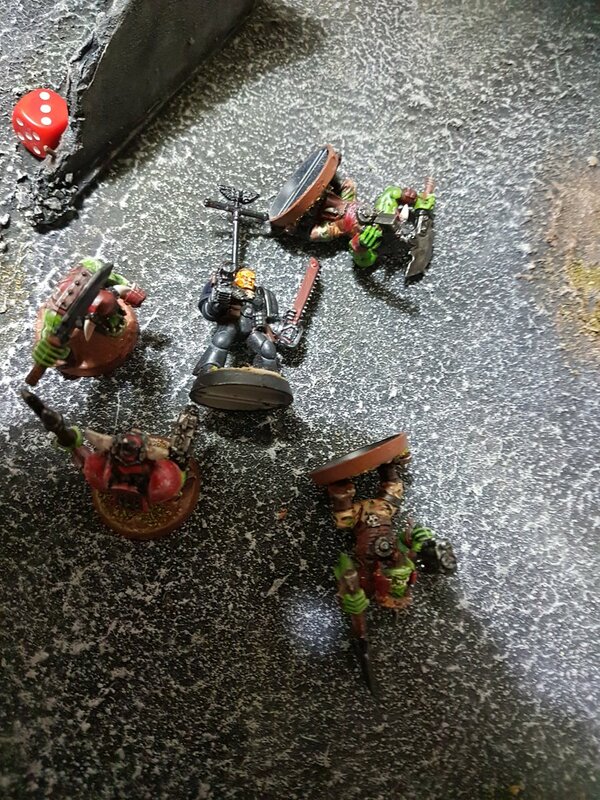 Taddeus barrels into the Ork horde..
And falls a hero, dead Orks on every side! And there we are, and Ork victory, but what a game! 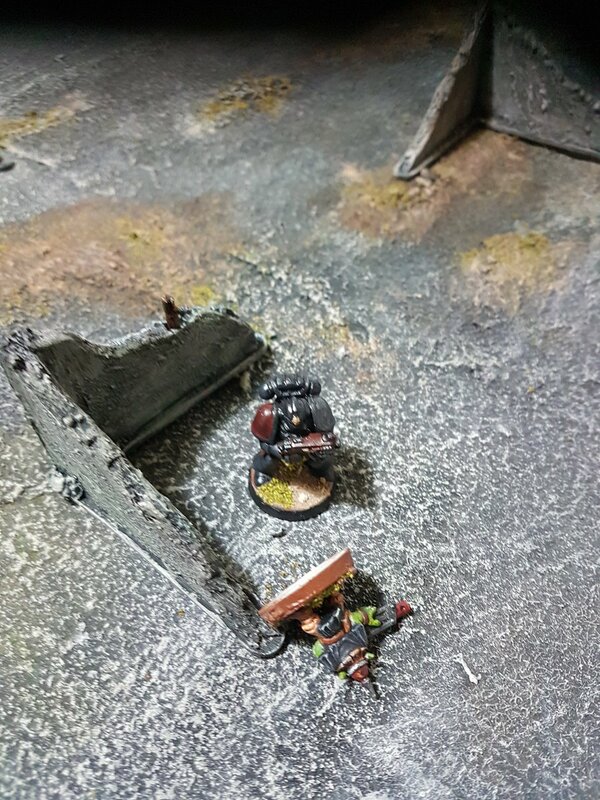 Right from the off the Marines were on the back foot, their most potent weapon blowing itself up – but what says 40k more than the last stand of Marine Sergeant Taddeus, surrounded by Ork corpses? Brilliant fun, despite 40ks inherent limitations, very cinematic – the game really wrote it’s own story, and isn’t that exactly why we play these things? Brother Lorenzio tapped his comm-link again and muttered a curse. No matter what he did, he couldn’t tune out the sibilant high frequency pulsating that he would almost swear sounded like some form of rhythmic high pitched bell… He put it out if his mind as the sonorous voice of Brother Sergeant Garcia came across the squad net. 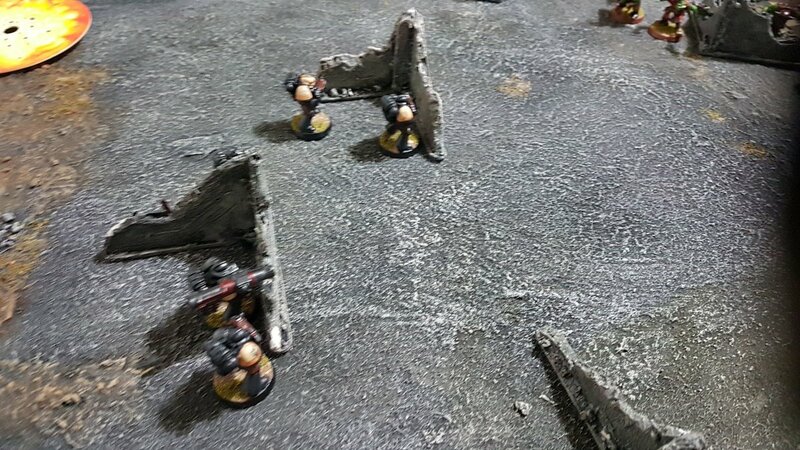 With that, the five Space Marines roared their assent and charged toward their foe.. Welcome to 2019! Over the last few months, Dan & I have been working on a plan to utilise the contents of our accidental 2017 purchase in the manner they were originally intended – recreating the mini campaign in the scenario book included with 1993’s Warhammer 40,000 2nd Edition box set. 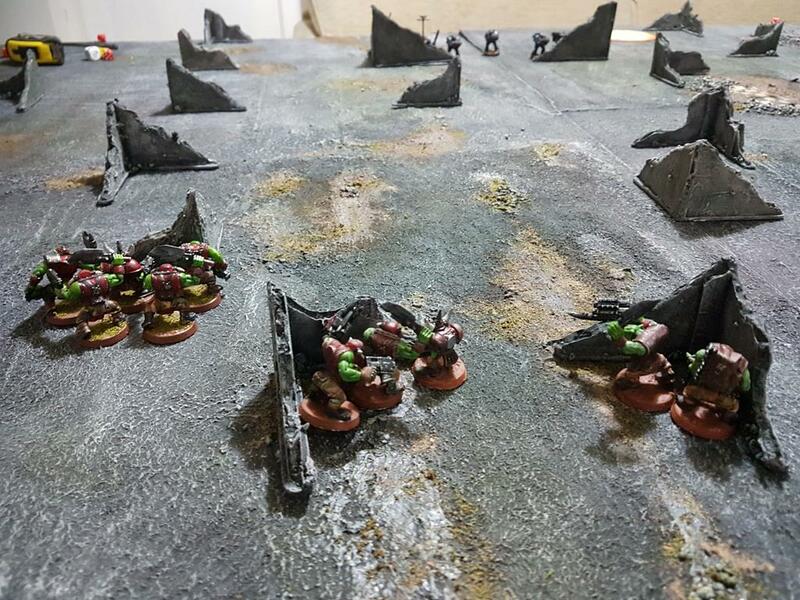 It’s taken a little while, but now we’ve got the urban board, the ruins, as well as enough Marines and Gretchin to tackle the first scenario in the booklet – “First Blood”. 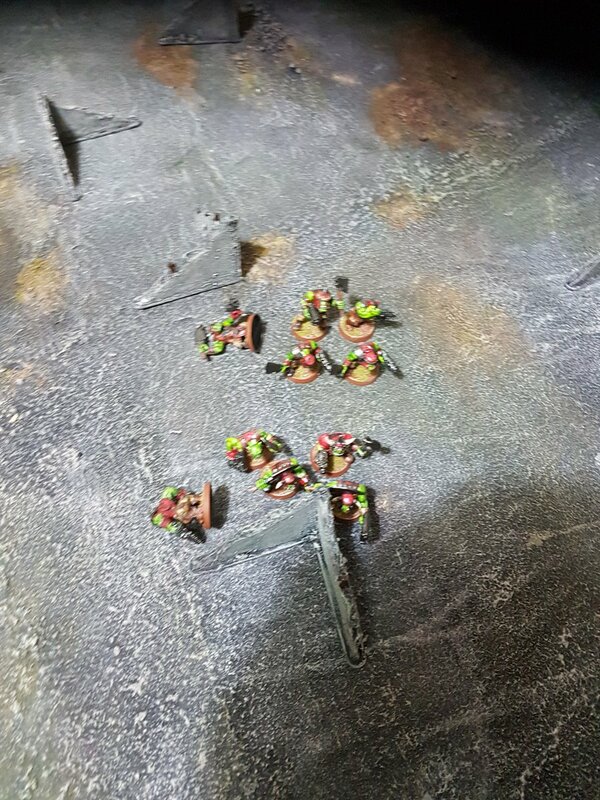 So, with bellies strained to bursting point with mince pies and mulled wine, we deployed troops (Dan taking the Grots) and had at it! 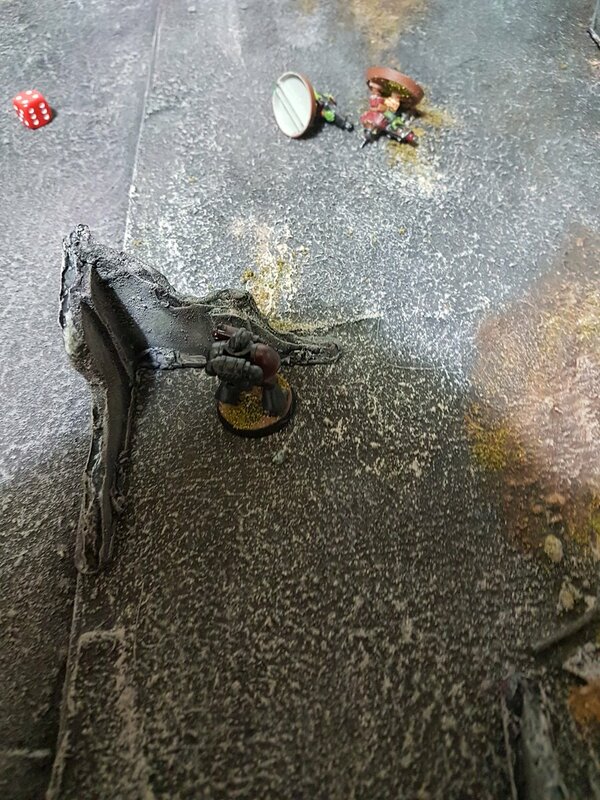 Marines cluster in the ruins at the bottom left, three Grot mobs close from the top..
Massed autogun fire takes down Brother Fiorian’s flamer… damn, that was going to come in handy! Bolter fire downs two Grots in return, but the Marines know they don’t want to get bogged down into a shooting match here, they need to get in close and use the force multipliers that are frag grenades..
“On my command, brothers!” bellows Brother Sergeant Garcia, “FIRE IN THE HOLE!” – three frag grenades arc toward Secund Mob, immolating the unwary Grots! 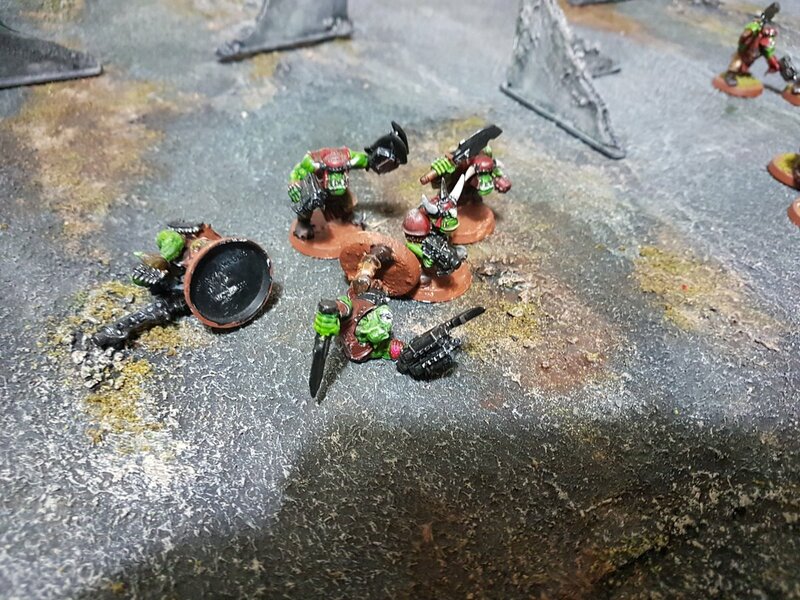 With fully half their number torn apart by grenades, and a paltry Leadership value of 5, it surprises precisely no-one when the Grots turn and flee! 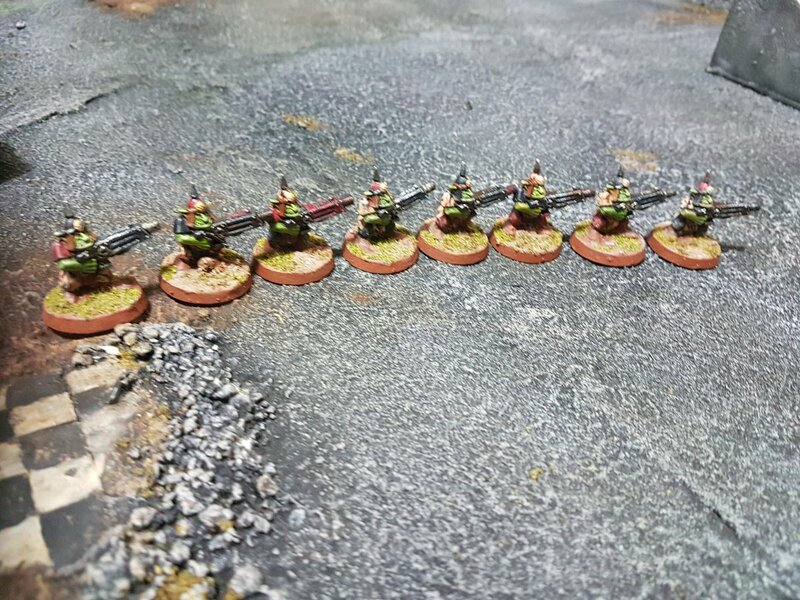 Furst Mob form a gun line flanking the Marines, autoguns blazing! And they do! 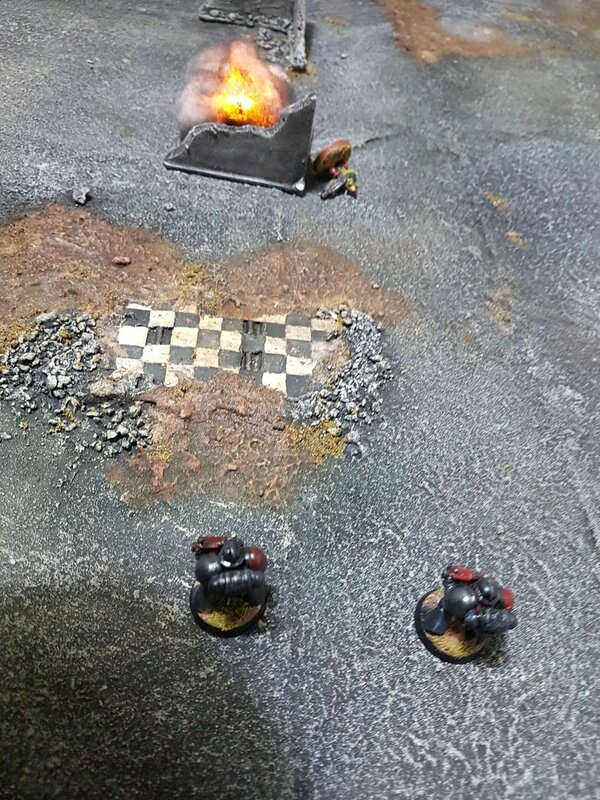 Frag grenades all amongst Furst Mob, killing off half the remaining number.. 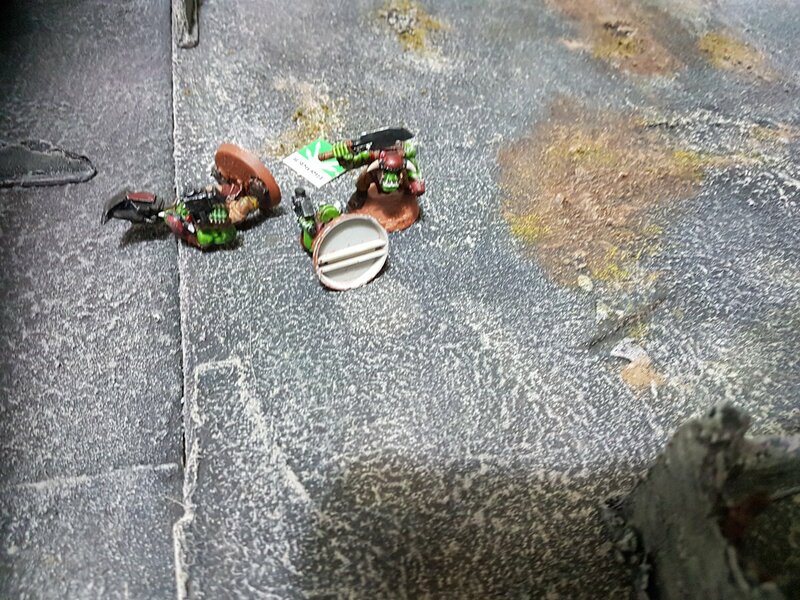 The survivors turn and flee..
Bellowing his vengeance, Brother Lorenzio barrels into the sole remaining Grot, gutting it from head to gizzard with his combat knife! 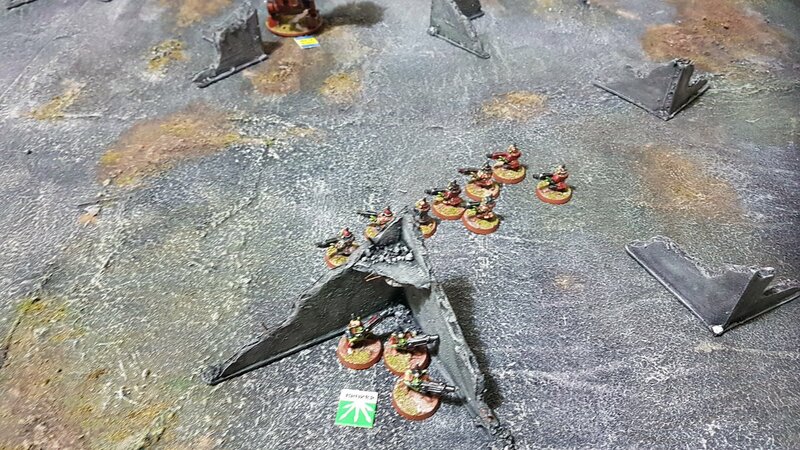 All in all, a very fun game, fortune went back and forth between the two sides – allowing my flamer marine to lead the advance was a rookie error, as that flamer template against the close packed Gretchin would have been carnage! But overall, it was a giggle, and while there are definitely better systems out there, 2nd Ed 40k is genuinely FUN, nostalgia angle entirely aside. Next scenario will be soon, just as soon as the frankly spectacular hangovers Dan and I are currently nursing decline to more manageable levels. In the meantime, happy new year and a prosperous 2019! So, hands up who remembers this? As it happens, we don’t either – don’t drink and eBay, kids! So, we were wondering what we should do with this haul – loads of Grots, a full complement of 20 Marines, and a couple of Orks in various states of repair… not to mention the cardboard cutout Dreadnaught, plus the very brightly coloured Codex Imperialis and campaign book. 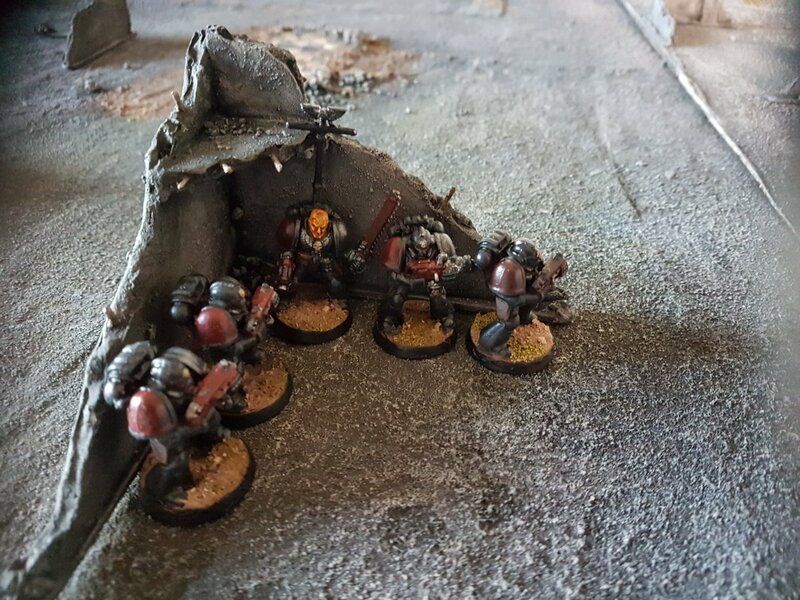 Now, this raises an interesting, almost paradoxical conundrum – because we can’t afford proper 40k minis, we’d got sunk deep into 20mm (aka 1/72 or 1/76 or HO) gaming, meaning all our terrain was designed and sized for this. 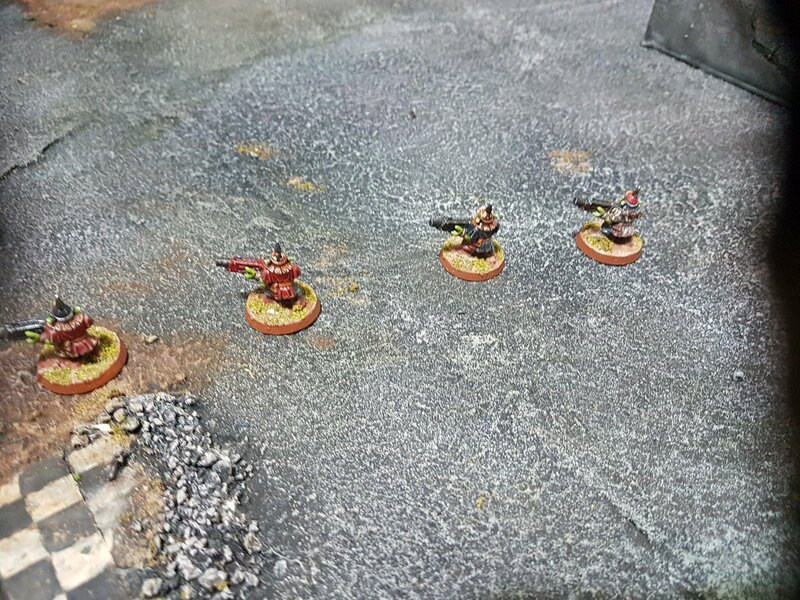 So getting our hands on actual 40k minis kind of threw the plans out a bit. As discussed before, we planned on using them as proxies for OOP systems like Firefight, Space Crusade etc (not to mention freely downloadable ones like Deadzone), but with all this… stuff… it was more or less a given that at some point we’d end up giving 40k a try again, and we’ve had a couple of little skirmishes with our new skirmish board. And yeah, compared to modern systems, this old girl is a bit clunky. 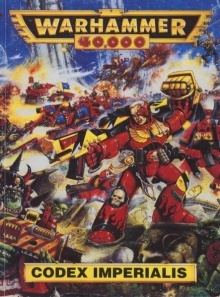 But we got to thinking – both me and Dan got into 40k in 1991 (albeit independently of each other and hundreds of miles apart) and by then the 1st edition Rogue Trader had evolved massively from it’s origins as an almost unplayable (in practical terms) RPG/ skirmish game and was heading towards the slick and shiny and GLORIOUSLY colourful subsequent editions. 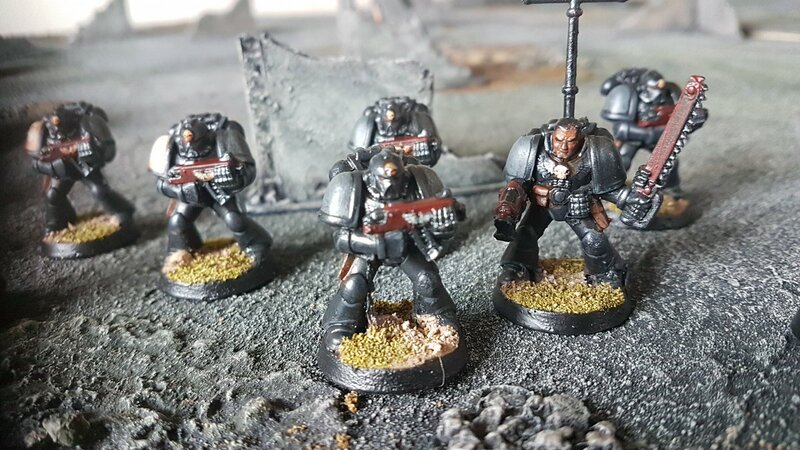 Dan and I both remember getting the 40k box set – and be aware, a 40k box set was a brand new thing back then, never been done before! 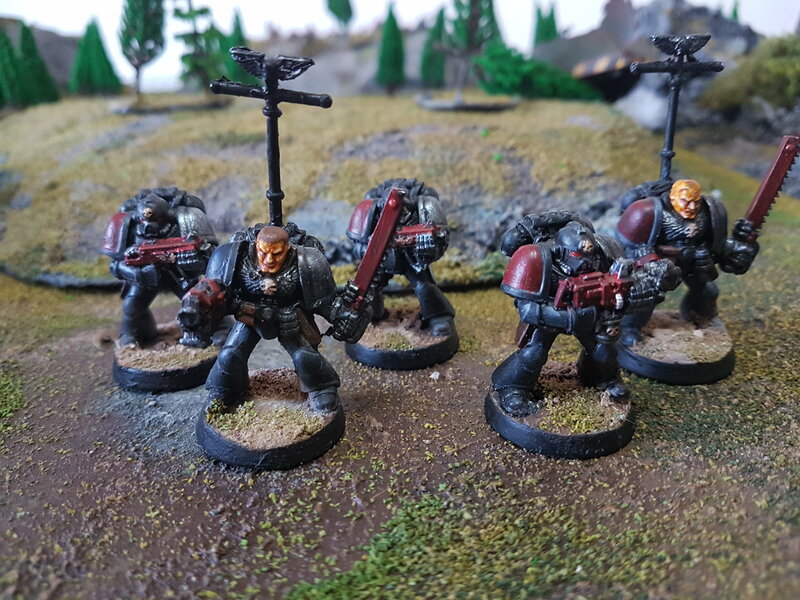 – for Christmas 1993, and working our way through the mini campaign missions given in the book. If you’re unfamiliar, this set focused heavily on the 2nd War For Armageddon, and featured a three (four?) 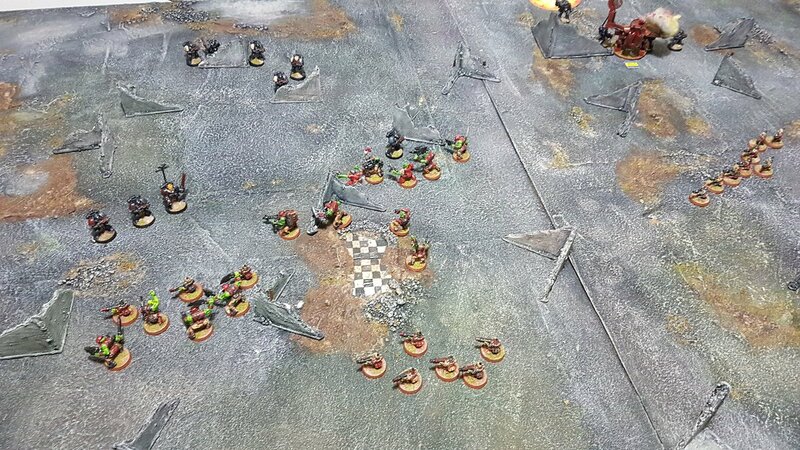 mission campaign of Blood Angels vs Orks. Then Dan reminded me that 1993 was 25 years ago exactly. Hmm. We should mark this occasion. 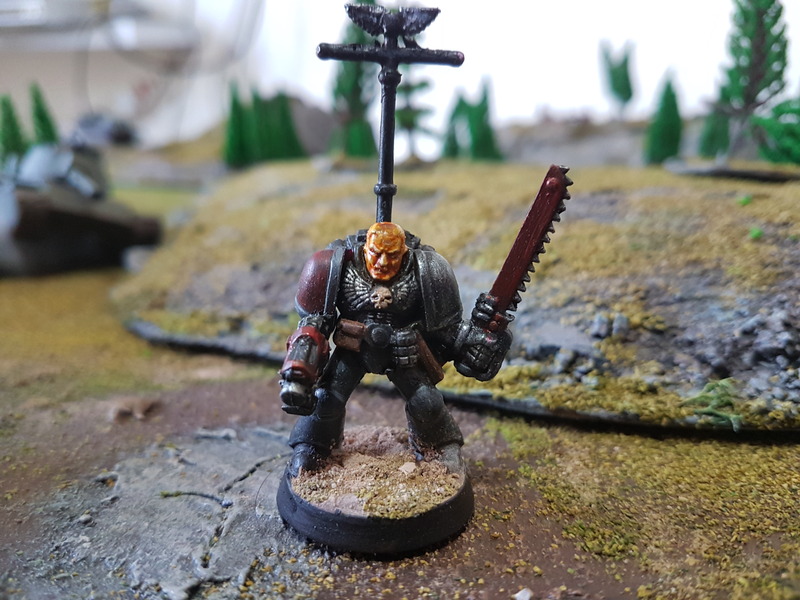 We did something similar last year, commemorating 30 years of 40k by playing The Battle At The Farm from Rogue Trader using 8th Edition rules, and had a blast, but we figured, you know what? 2nd Ed was our edition. 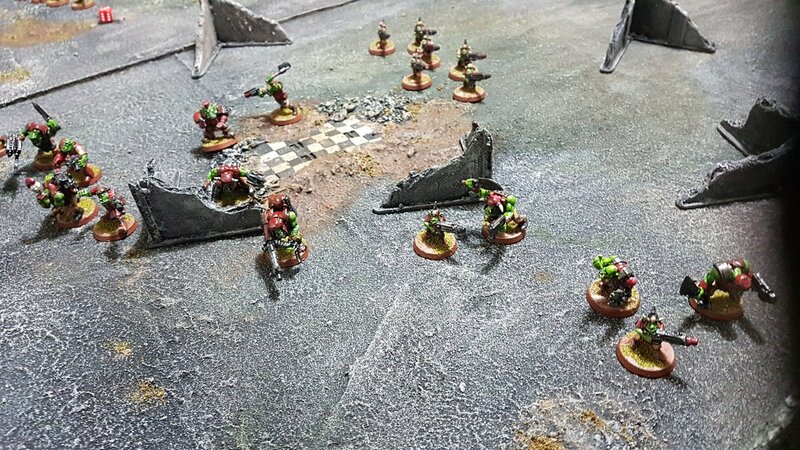 Goblin Green bases, primary colours – the grim darkness of the far future had never looked so appealing. Army lists existed from the drop, rather than being gradually added over six years of White Dwarf articles. Or Warhammer 40000 Battle Manuals. You bought wargear with cards rather than having a 15 % chance of having it. 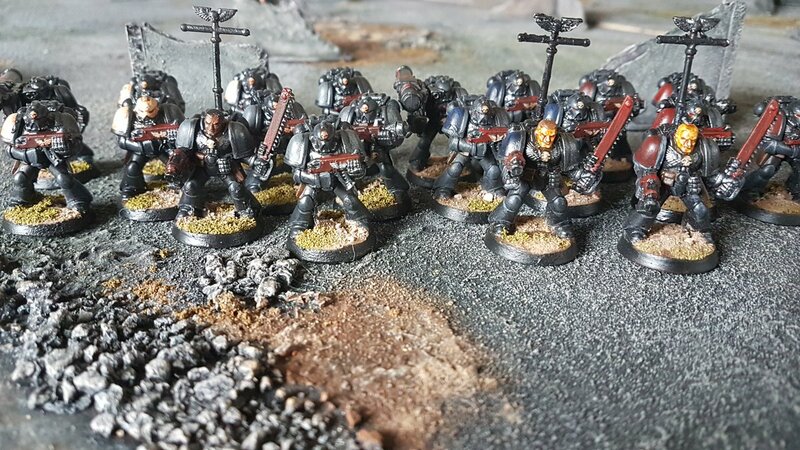 The thing had been tested, and many mechanics from 2nd Ed actually form the backbone of 40k as we know it now, love it or loathe it. 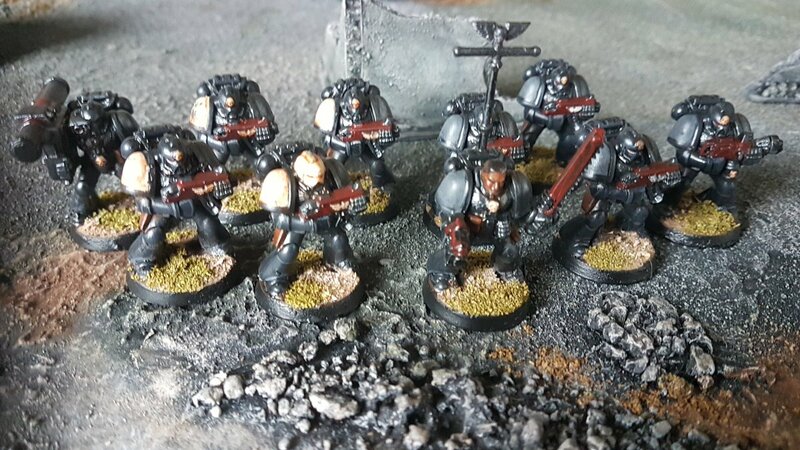 We may not have had Tau or Necrons, but we had Squats, dammit! 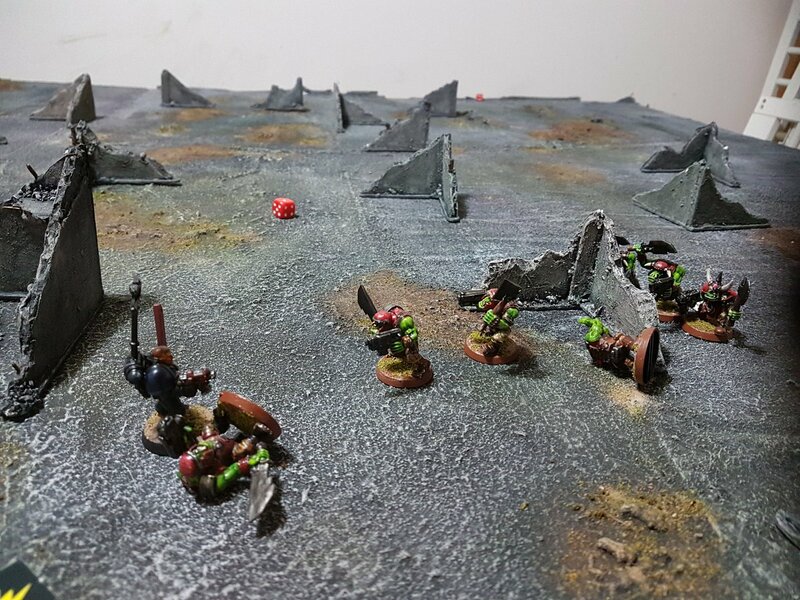 (at least for a while..) And so begins our new project for the remains of 2018 – painting up the contents of our unwitting haul to replicate those halcyon days gone by – we began with the Marines, and Dan has a load of Grots ready for the camera – then there’s the scenery to make… lots of ruins (which we’ll make 3″ by 3″ to also be Deadzone compatible – muy Skinflint).. plus we have found a very cool papercraft of an Ork Deff Dread… And then come Christmas, we’ll run the whole campaign! 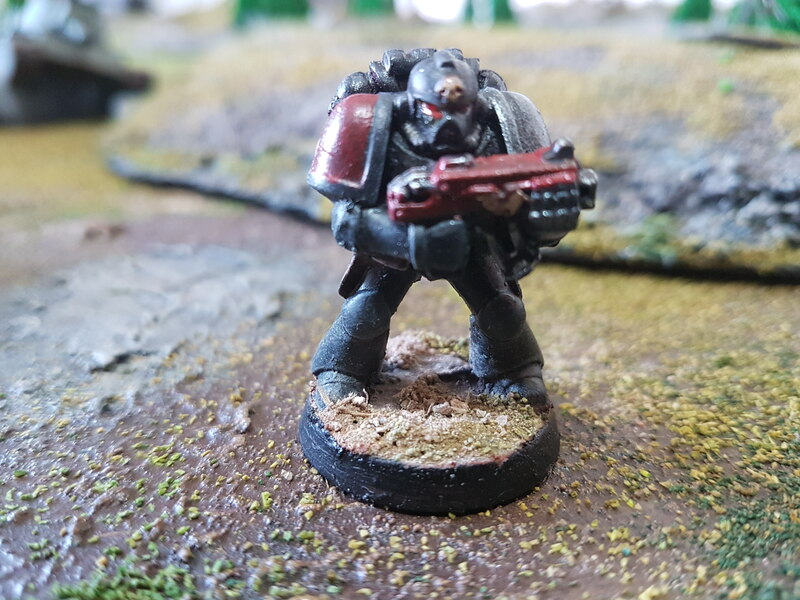 So, here’s raising a glass to our “origin story” within the hobby – we may not be the seasoned grognards in at the birth of it all with Rogue Trader, but we were there for 40k to find it’s feet and become what it is today. And for all it’s (many many ) faults- it will always have a place in our hearts. Seasons greetings all! It’s becoming increasingly clear that with the onset of age, the passage of time speeds up to frankly alarming proportions. I’d swear blind that not five minutes ago Dan & I were raising a glass after a cracking game of the GW classic Space Marine (where the Redeemers Space Marine Chapter fought a valiant action against the villainous Ork hordes of Waaaagh-Bozzhog), and then I check the calendar and discover it’s actually a YEAR. I know. Shocking. And HIGH time we remedied things. Back in January, my Redeemers got themselves all tidied up and based, and organised into a 4000pt force and not long afterwards I got busy with the hot glue, cardboard and drinking straws and turned a piece of Christmas present packaging into a majestic Leviathan superheavy command vehicle for the Hazzard 1977th Imperial Guard regiment..
Grand Total – 4350pts. And this time we’re sure. 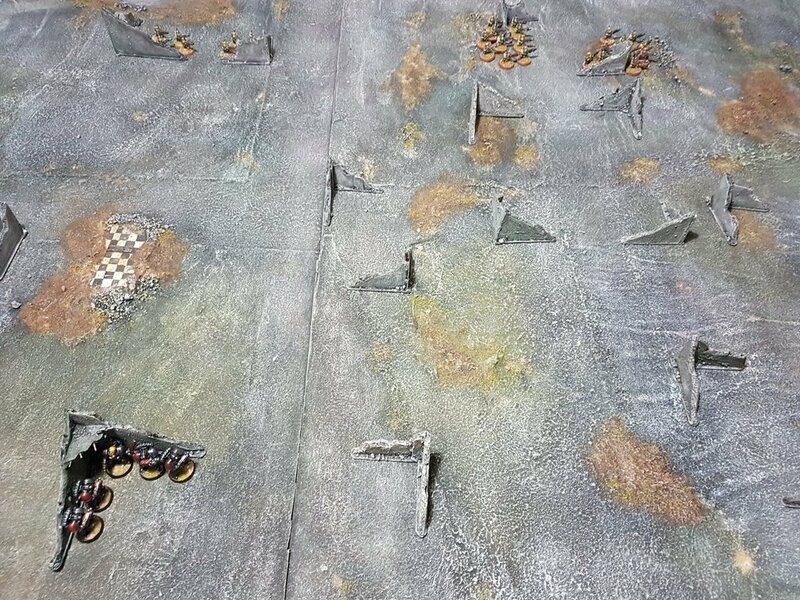 We rolled up a health mix of terrain, including several towns – too many, in fact for the buildings we had supplied in the box so we broke out some of the home made sci-fi terrain we made earlier on in the year (which never made the blog- might have to remedy that) to fill in the gaps. 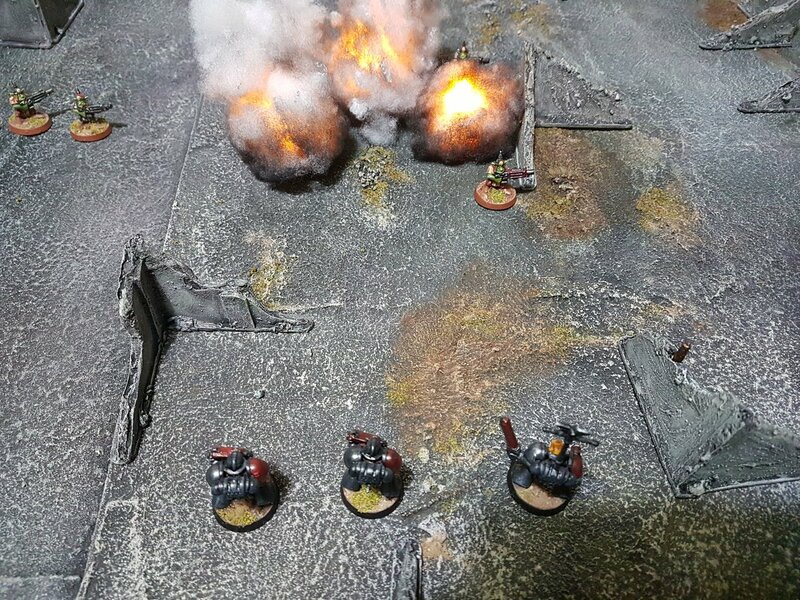 This worked out quite nicely – the Orks would be rushing to loot the vast giga-storehouses of Hazzard’s finest export moonshine, certainly a mission which would require the Redeemer’s immediate attention! Bugger, I wanted that side! Right, never mind, a Marine is nothing if not adaptable.. looking at the terrain and bearing in mind the experience of the previous game, my rough plan was to get the Leviathan, Devastators, Warlord and Whirlwinds into position and firing as quickly as possible to whittle down the Ork numbers and counterattack with the Veterans and Terminators when the time was right. 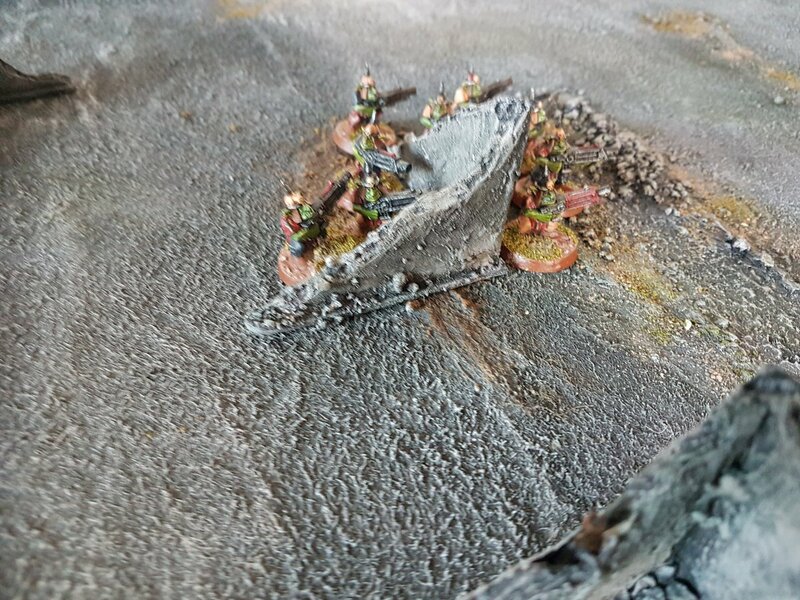 Scouts would sit on the backfield objective and protect the Whirlwinds while the Land Raiders would act as a fire brigade. To this end, I placed the armour and the Leviathan covering the open ground on the right flank, Devastators would advance to capture objectives 2 and 3 and plaster fire into the oncoming hordes. 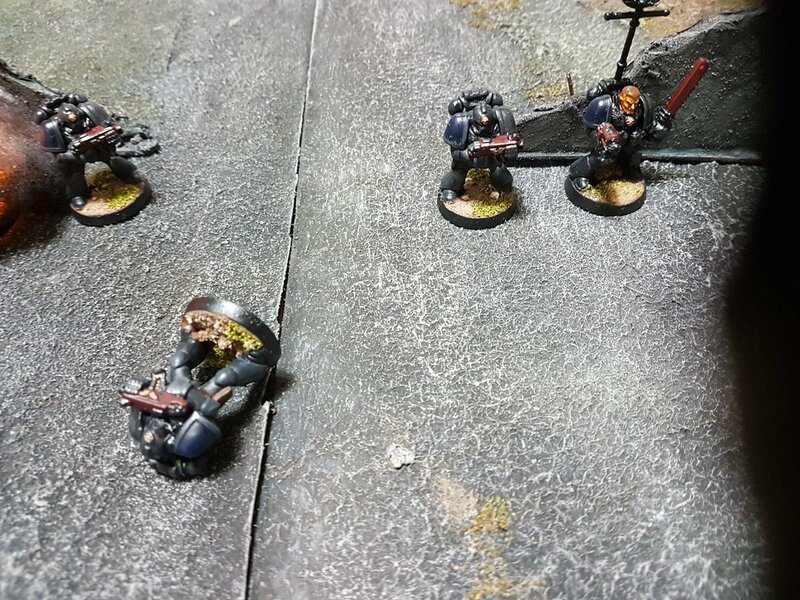 I debated what to do with my Veterans and Terminators and eventually decided on something audacious – Veterans would charge forward onto Objective 6 and use that either to springboard an assault or pull back in a fighting retreat onto the Devastator’s guns, while the Terminators would ambush any unwary stragglers. With this rough plan in mind, the Redeemers and the PDF crew of the Leviathan finished their final weapons checks and turned to face the enemy..
Haha, for once the dice gods favour me! 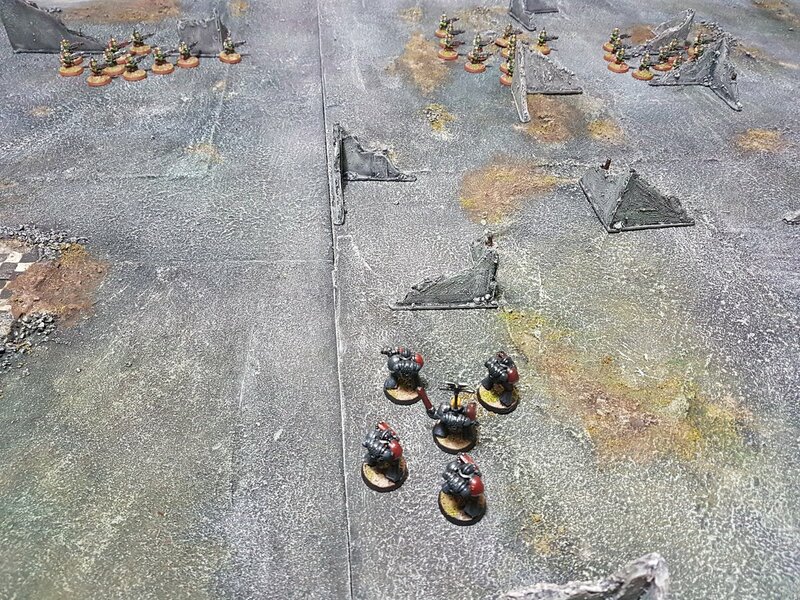 Right, my basic strategy with this army was three pronged – Evil Sunz would loop around and charge in, pinning the main enemy unit in close combat, before pulling out and leaving the central column of heavier but slower moving Goffs to finish them off. 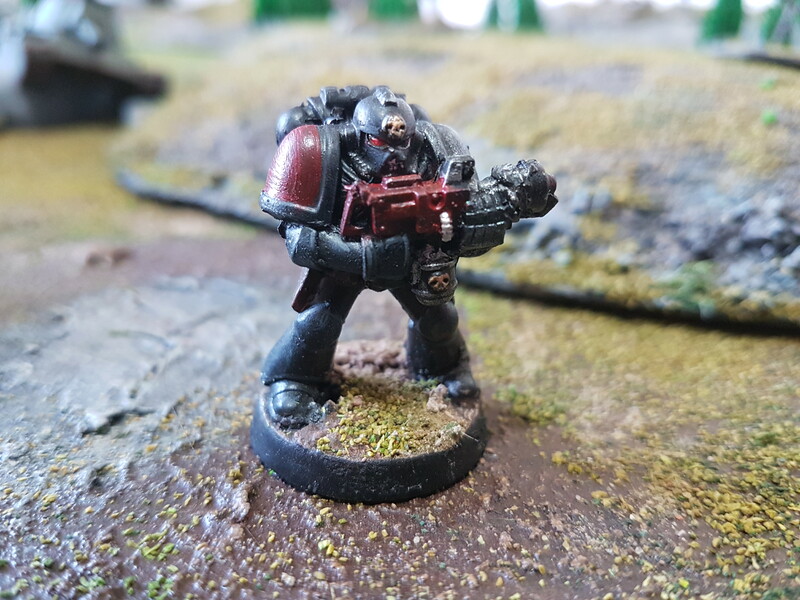 Meanwhile the Bad Moons and the Slasher wold provide covering fire and if any close combat targets of opportunity presented themselves, the Slasher would take care of them. 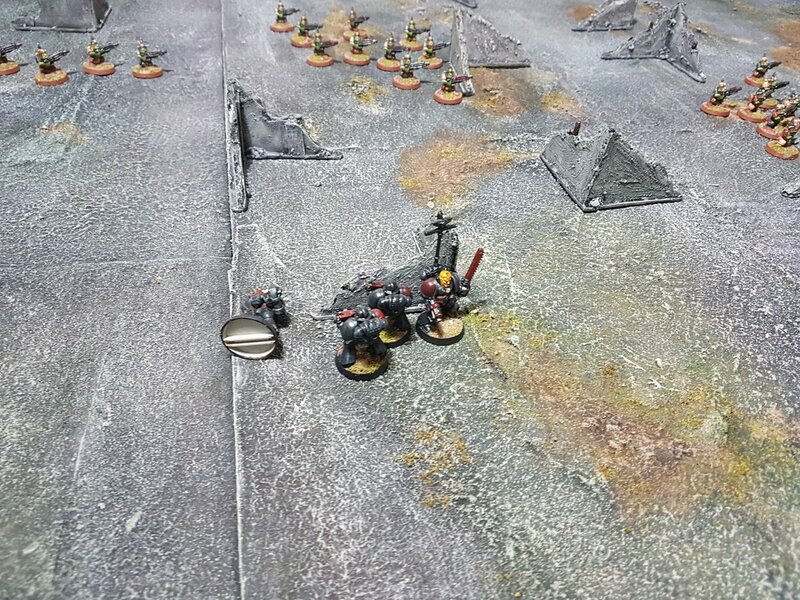 Following this, Bad Moons deployed onto the hill with orders to advance onto objective 7 and 5, while the Goffs would charge “hey diddle diddle, straight up the middle” with the intent of pulverising any Imperial unit foolish enough to stand in our way, and the Evil Sunz would secure Objectives 2 and 3. From there – we’d see what happened..
Redeemers Veterans and Terminators, with the Medic, realising they’ve massively misjudged deployment..
Imperial centre – Whirlwinds prepare to rain fire on the greenskins, Scouts ready to move up to secure objective 8 and protect the artillery while the Warlord gets set to stride into the fray! The view from the Imperial lines… ulp! 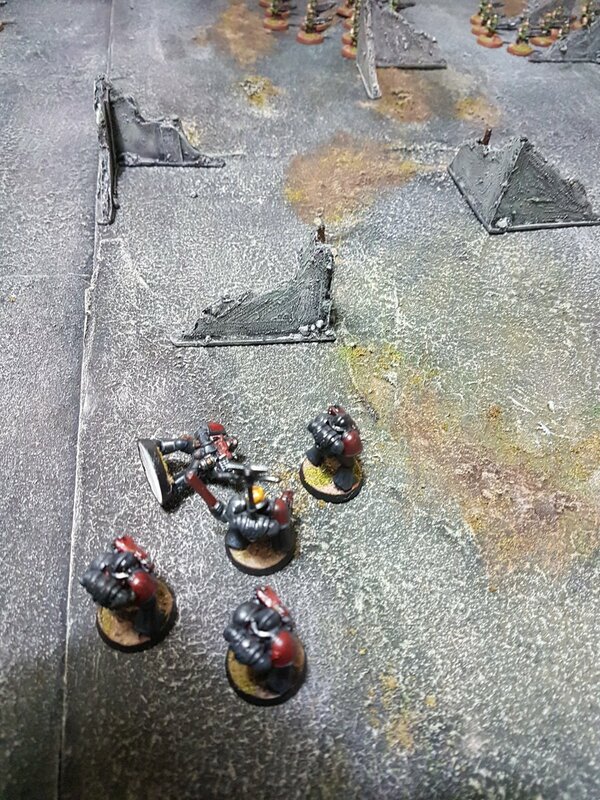 The Imperials won the initiative and forced the Orks to move first. 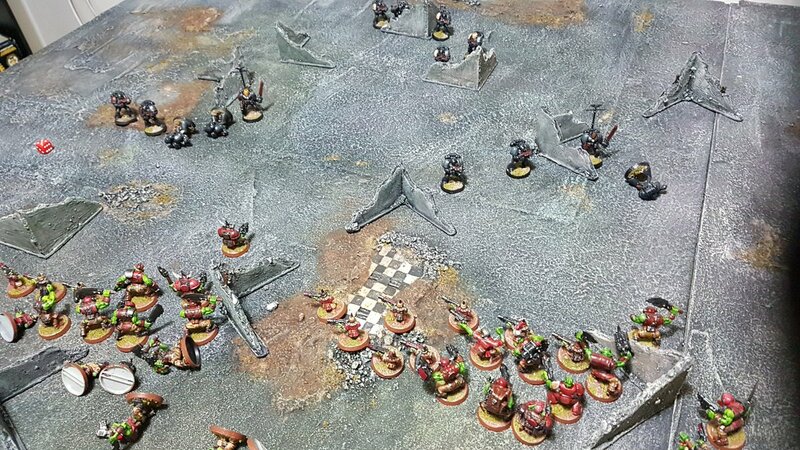 This was somewhat intimdating as the Bad Moons and Slasher grabbed three objectives on the Ork right, while the Evil Sunz floored their throttles and hurtled toward the towering peaks of Objective 3, and the Goffs bellowed a mighty WAAAAAAGH, charging through the buildings in the centre towards the hated humiez! 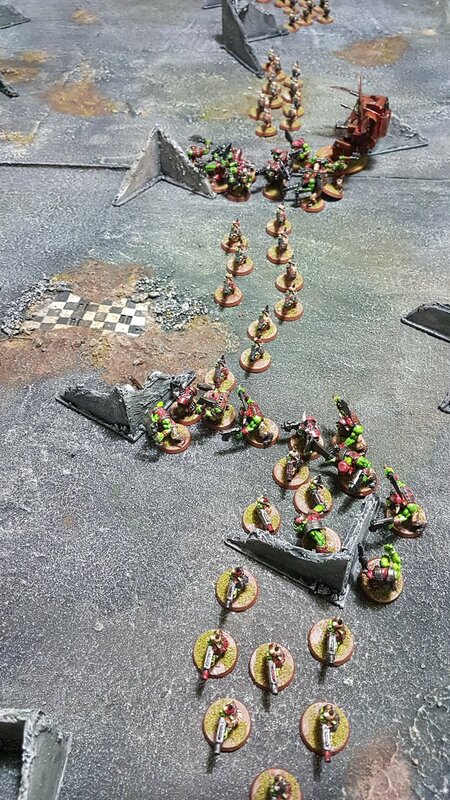 The Goffs emerge from the Ork centre..
Land Raiders swing out to spring the trap – but will it be enough? 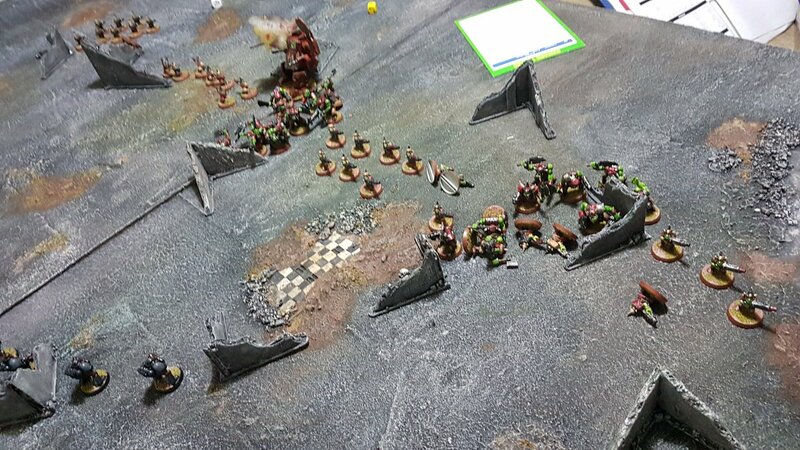 The turn began with a mighty WAAAAGH and the roar of greenskin V8s as the Orks won the initiative and opted to move first. 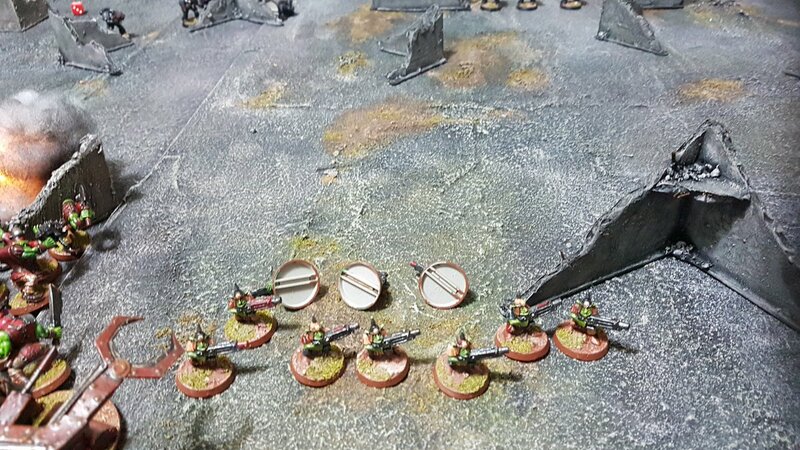 A wave of red and green engulfed the Devastators on the commanding heights of Objective 3 – hunkered down on First Fire orders, the Marines grimly zeroed their sights, waiting until they saw reds of their enemies’ eyes.. 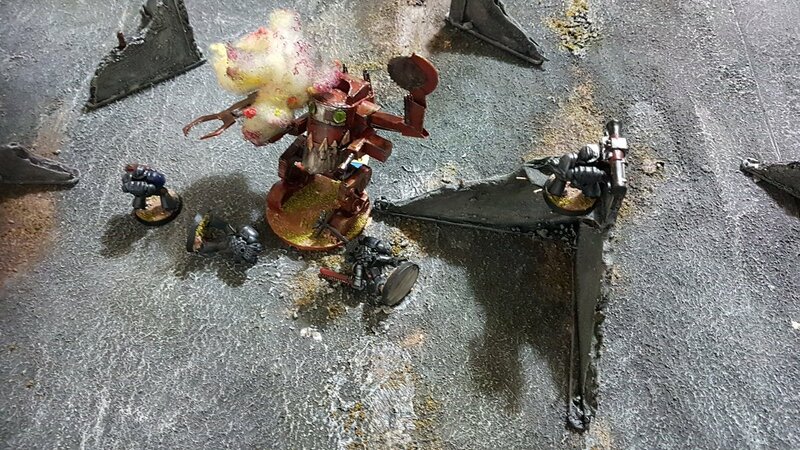 Forging ahead, the Skullhamma plows into one of the Terminator detachment’s Land Raiders. 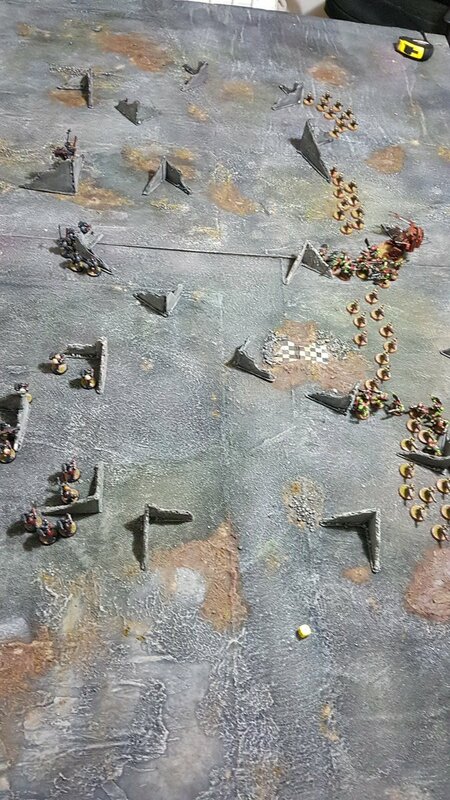 Imperial artillery lays into the Goffs, felling ten stands of infantry – the boyz push on regardless! 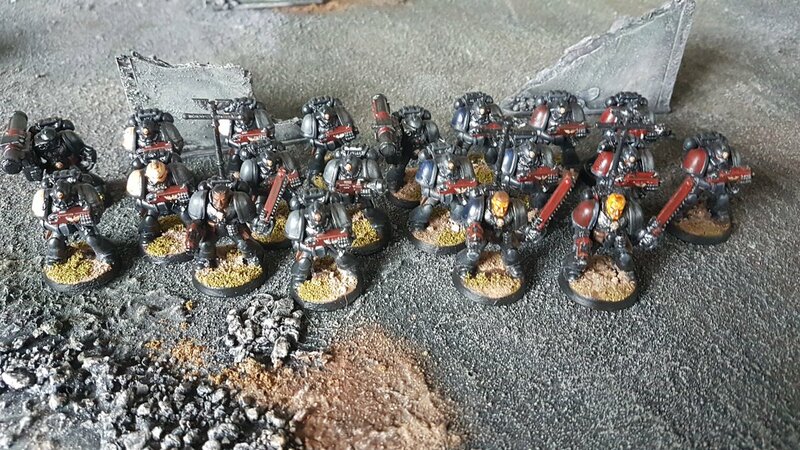 They steam in hard, but the Devastators still hold the hill! 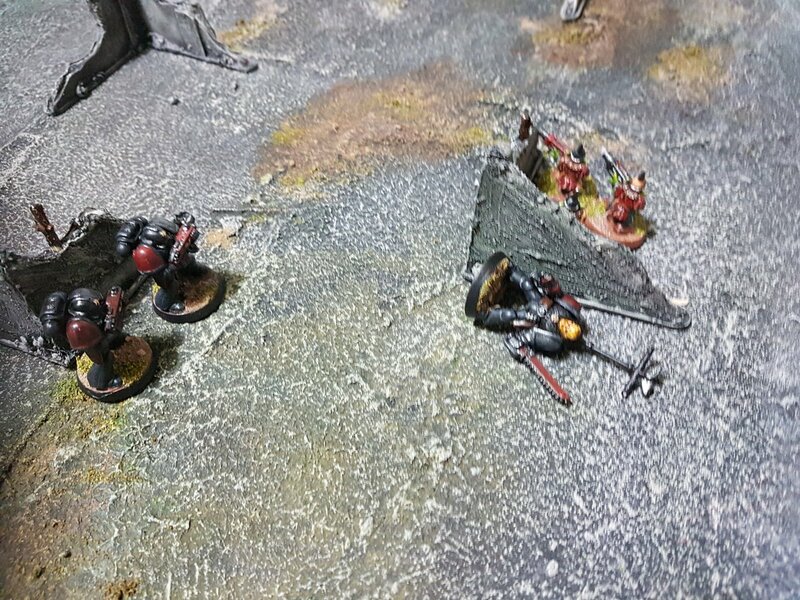 Meanwhile, the Skullhamma demolishes a Land Raider in the woods..
..before the Terminator infantry (on advance orders) destroy it in turn. That’s what you get for messing with a man’s ride. 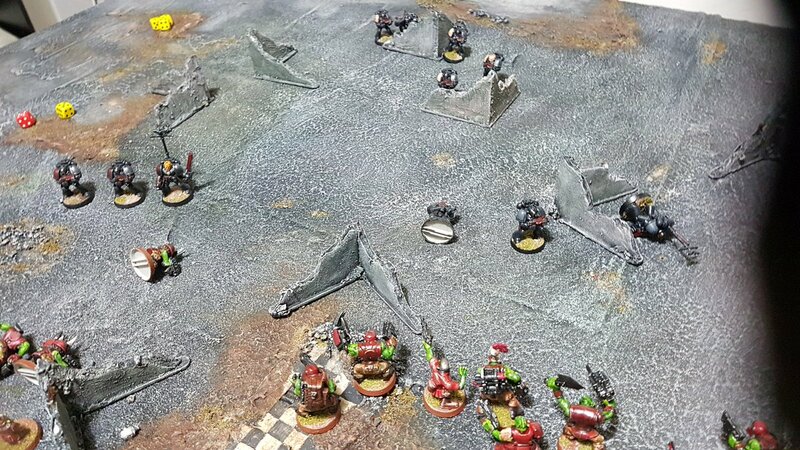 At the end of Turn 2, the marines hold 5 objectives, the Orks 3 – Imperial fire has detroyed the Skullhamma and broken the Evil Sunz, who are forced to fall back, but the Veteran Company is almost entirely wiped out. 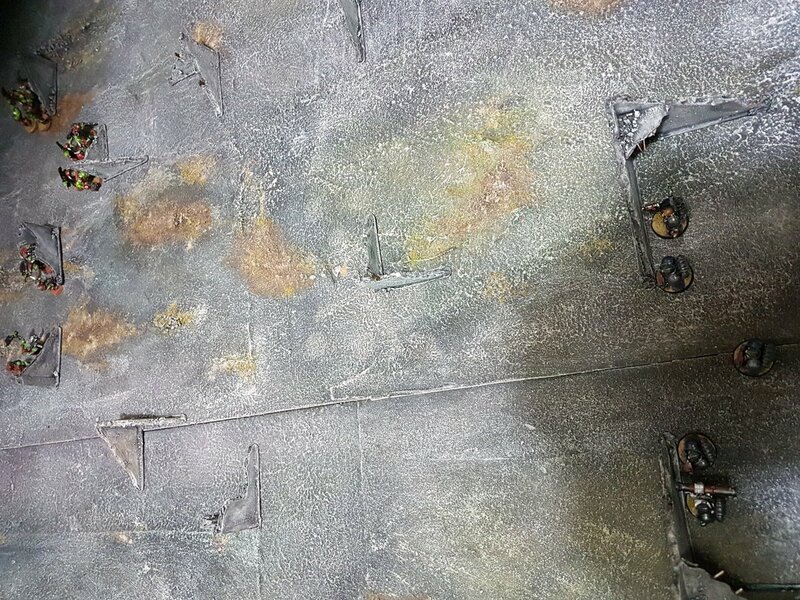 So the score stands Orks 24 VPs, Imperials 38! 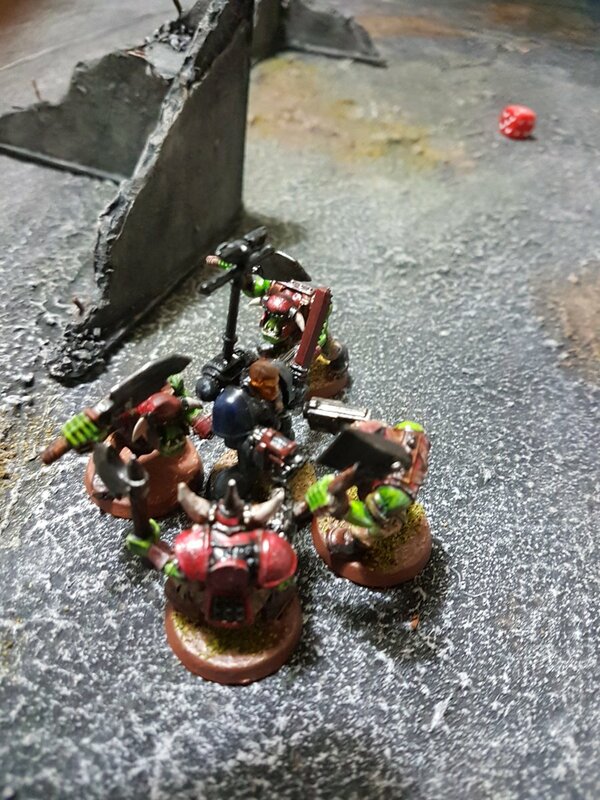 The initiative stayed with the Orks for this one, who opted to move first. 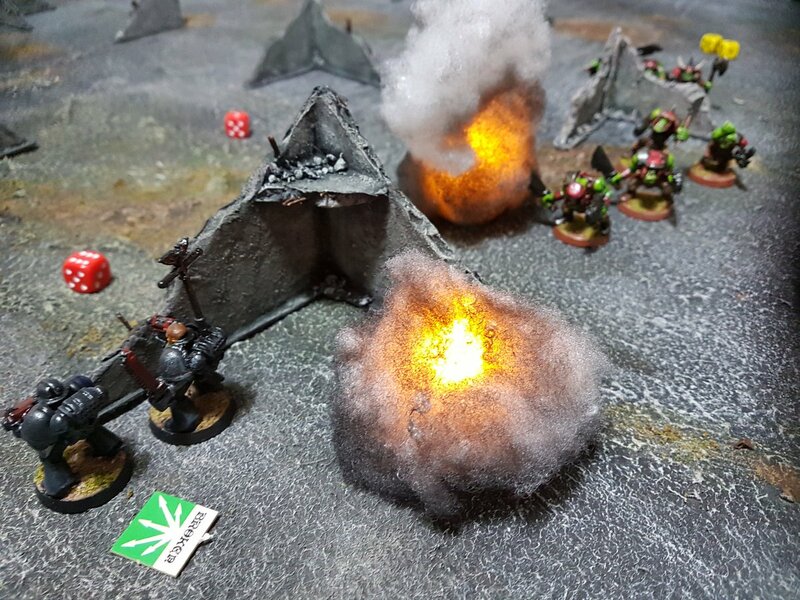 The Evil Sunz assault had been a costly failure, but with unexpected good fortune on the other flank – wiping out an entire company of valuable Redeemer veterans – would we be able to refocus and redeploy to take advantage? 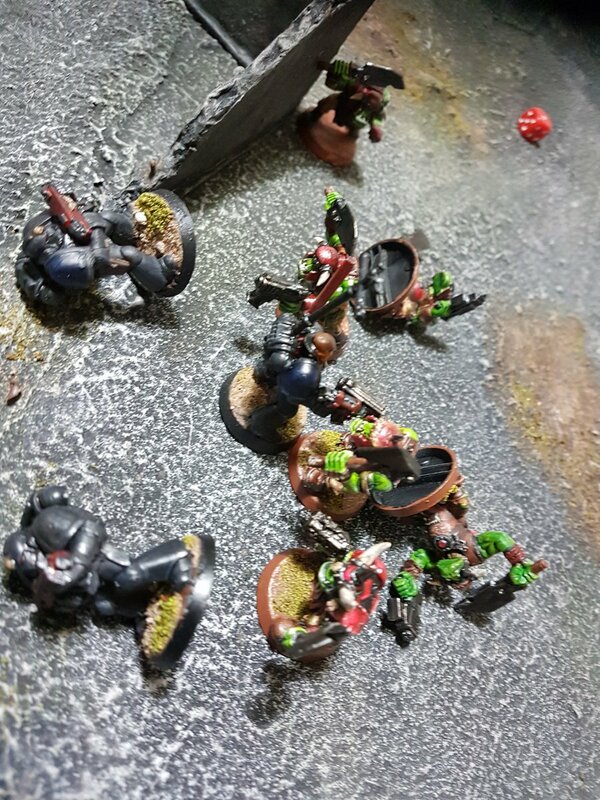 Hunkered down on first fire orders, Bad Moon Weirdboy towers lash the Redeemers, finishing iff the Veterans in the ruins and killing a couple of Devastators – it’s not over yet! 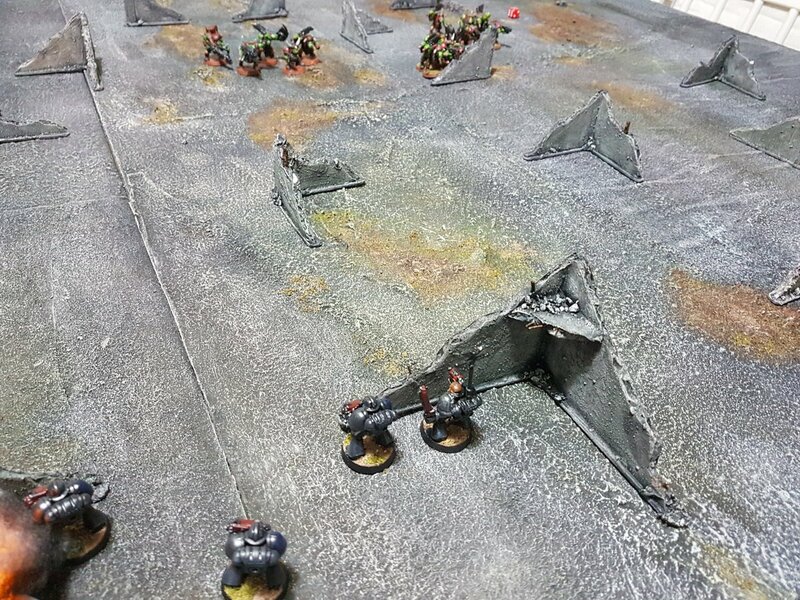 As Turn 3 comes to a close, the destruction of the Warlord and the proximity of the Goffs in the gulley to Objective 3 has flipped things around again – Orks now lead 37 to 28! 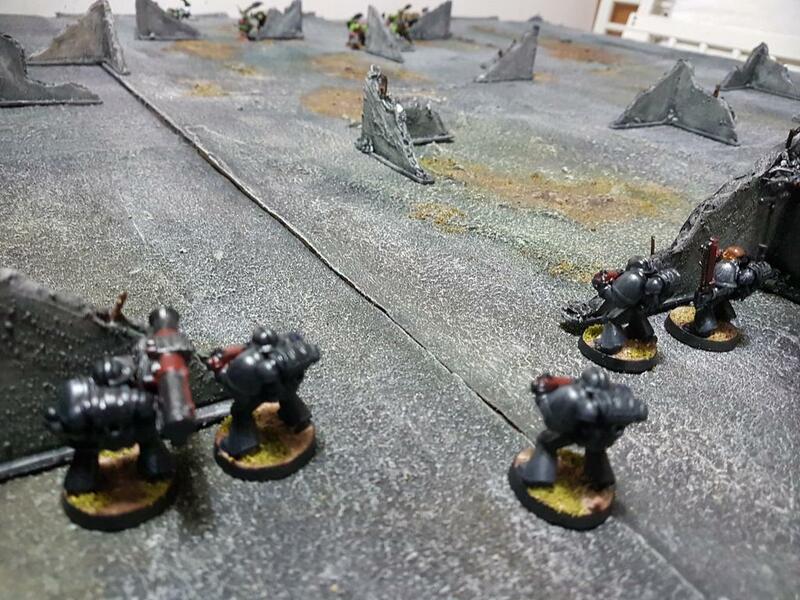 With the Warlord down, the Imperial left flank was reduced to a few stands of Terminators, but equally the Ork left had crumbled and the Bad Moons had taken heavy casualties to the point where they were perilously close to breaking – even at this stage, it was anyone’s game! 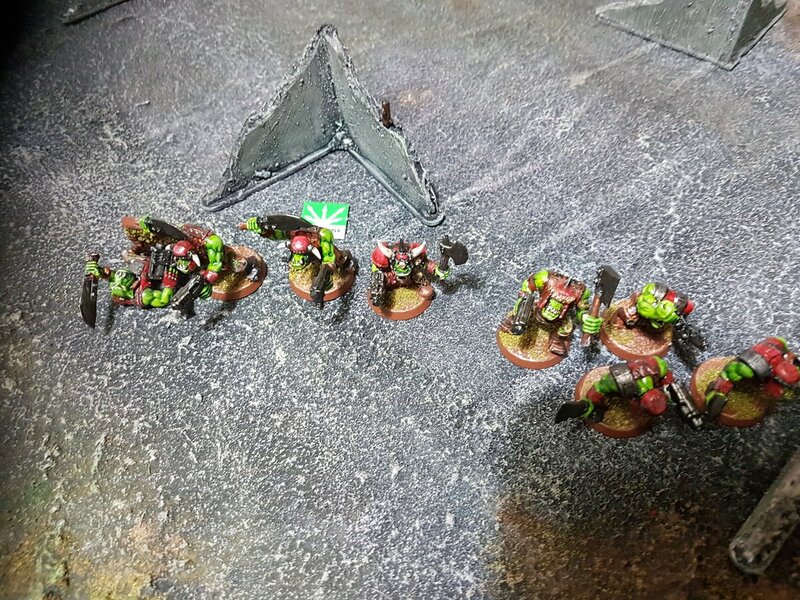 The Orks won the initiative and opted for a bold, aggressive strategy.. 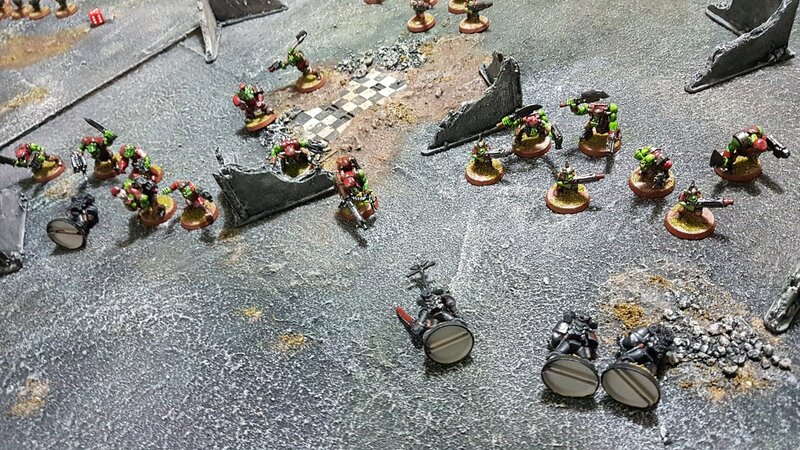 The Imperial side won the initiative and opted to go first – with the remaining Orks running wild, only an equally aggressive strategy could pull things back! 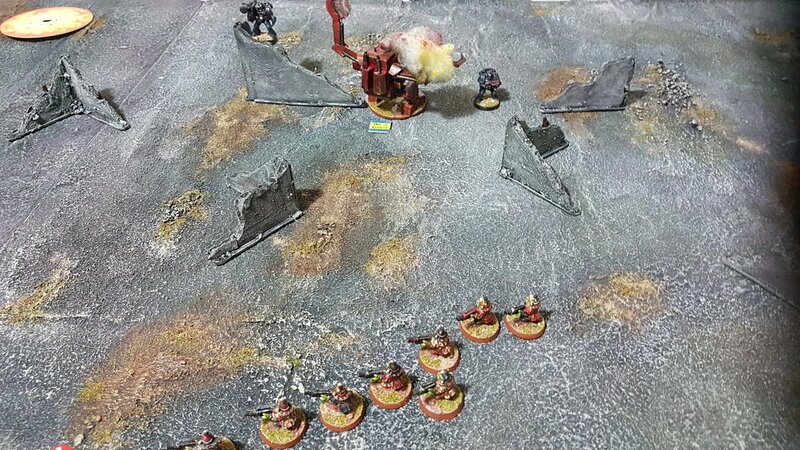 And as the Devastators recapture Objective 3, it’s all over! 59 VPs to the Marines, 46 to the Orks. What a game! 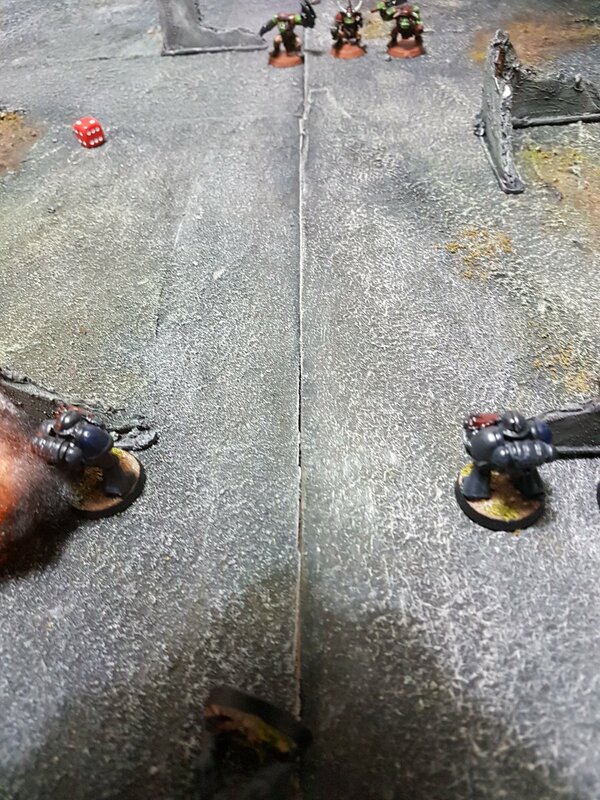 Right until the end it could have gone either way, especially after the Warlord disintegrated (as he seems wont to do every game).. and the ballsy charge of the Goffs and the Slasher almost swung it. Had the Evil Sunz assault gone better it would have been all over for the Marines, but Dan admitted to getting to unfocused, trying to capture Objective 2 as well as carry the assault. A bit more concentration of force would have enveloped the Devastators and most likely annihilated them. And what the hell was I thinking putting my entire Veteran company in the warehouse?? I may as well have left them at home! 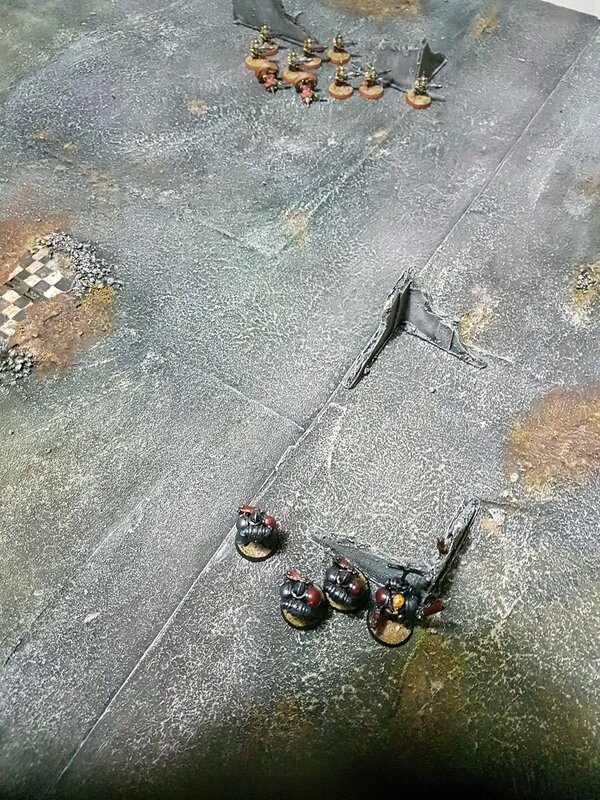 The Goffs are a weird bunch, clumping infantry and tanks together means something very hard hitting but at the same time hard to position right, and it was only really Turn 4 when they were in position to do something significant – and by then they’d suffered enough casualties to have broken. Dan’s going to try mounting them in Battlewagons next time… ulp. 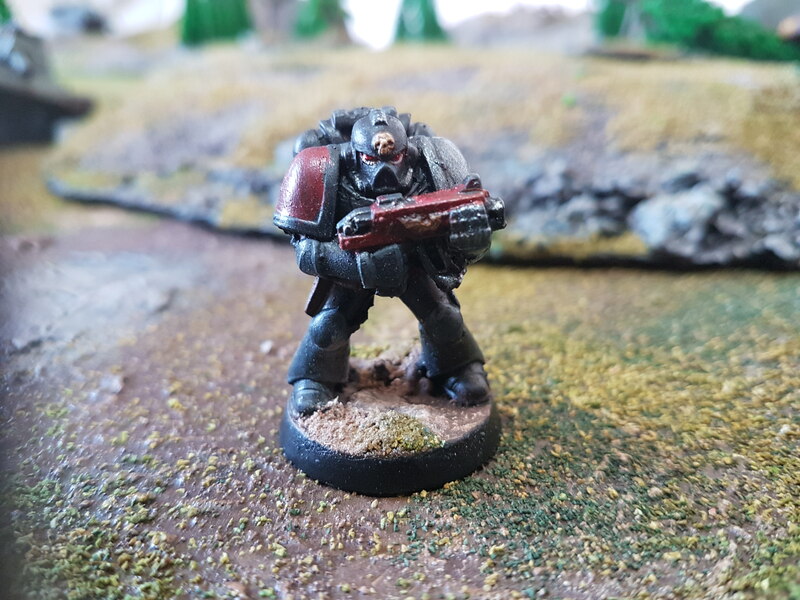 Most Valued Player for Dan was undoubtedly the Slasher, 600 pts but chewed it’s way through 1850 pts of Marines and Titan – nearly half my force! For me, I was impressed by the Leviathan, it’s long range cannon let me put the hurt on the Bad Moons from the opposite end of the table, and in the end that helped push us over the line. 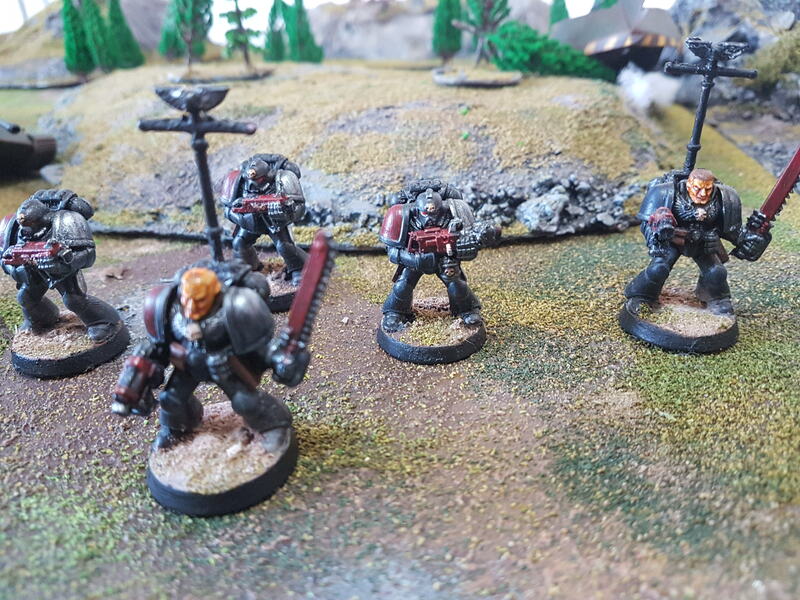 So while we mourn our Veteran brethren and Warlord (and Scouts.. and Whirlwinds.. and Dan managed to kill a stand of Terminators to break them too..) the Leviathan leads a battered taskforce of Land Raiders and Devastators to secure the remaining precious stocks of Luna Luceat liquor. The Imperial Festive Season must go on! Happy New Year everyone, stay thrifty into 2018! Don’t drink and eBay, kids! Not awful, but I think there’s room for improvement – will bathe them in meths and have a go myself! A TON of cards- man, we hated trees back in the day! Now, quite what to do with this unexpected new acquisition – we’re pretty deeply committed to 20mm as our scale of choice with a load of new scenery built for that scale, so the minis may remain display only.. suppose the Grots could be some sort of Ogre race, the Marines some sort of gigantic superhuman genetically altered superwarrior (hang on…), and the templates are all gauged for 28mm. 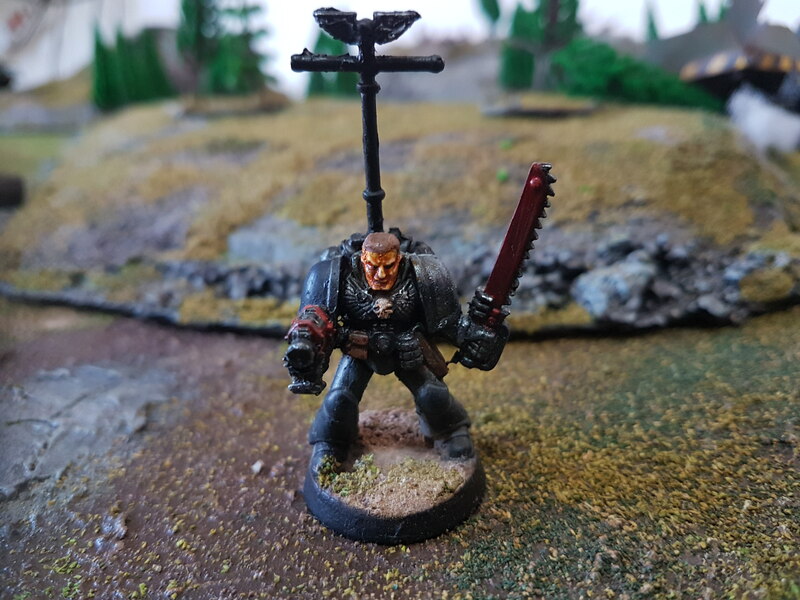 So we pondered for the length of a beer and though “F**k it, who cares?” – we’ll use the templates and our wee 20mm minis and run some retro mini 40k for giggles. 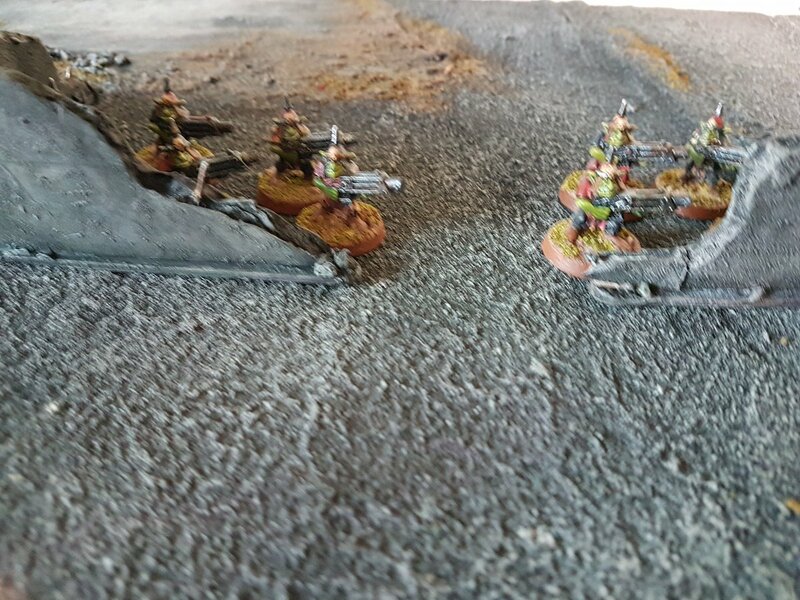 A serendipitous rummage through the loft yielded up the 2nd Ed Guard and Ork codexes from the mid 90s, tattered but unbowed, so we set about tweaking the Hazzard 1977th and Da Skooderia to be 2nd Ed legal. 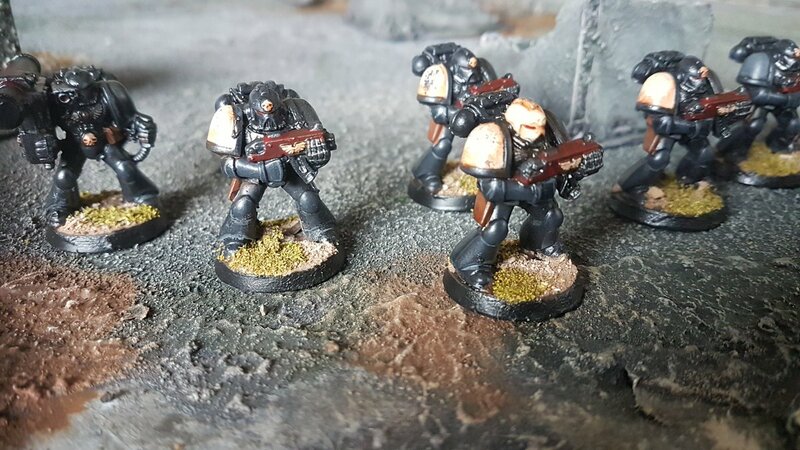 Results will be posted over the next couple of months, and we’re looking forward to running some retro 40k with teeny models! And let’s not forget Apocalypse: Earth’s sci-fi spinoff, where humanity takes it’s first steps into a wider galaxy…. we can call this market research!